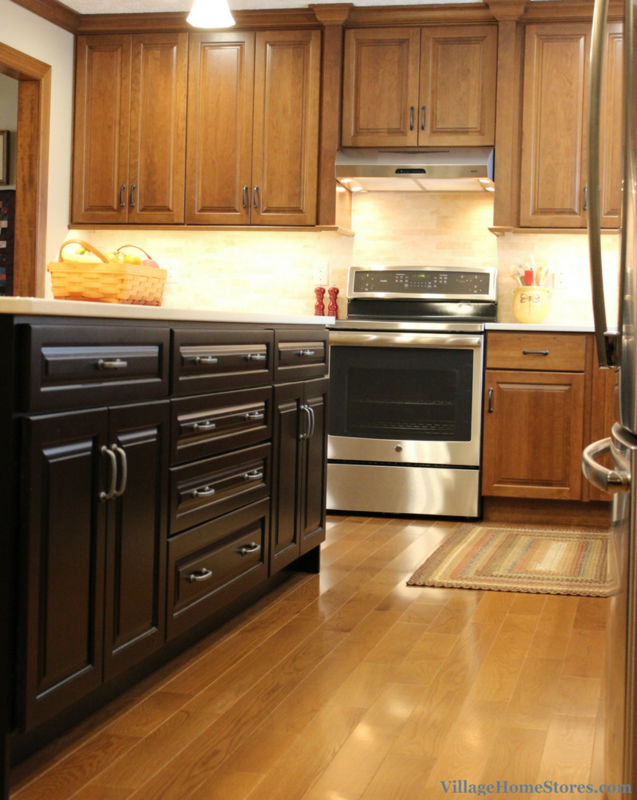 We were so thrilled to begin this kitchen remodel in East Moline while we were filming a season of our TV show. It allowed us the opportunity to go beyond just showing you some before photos and then tour the finished space. Instead we were able to really show you the entire process! 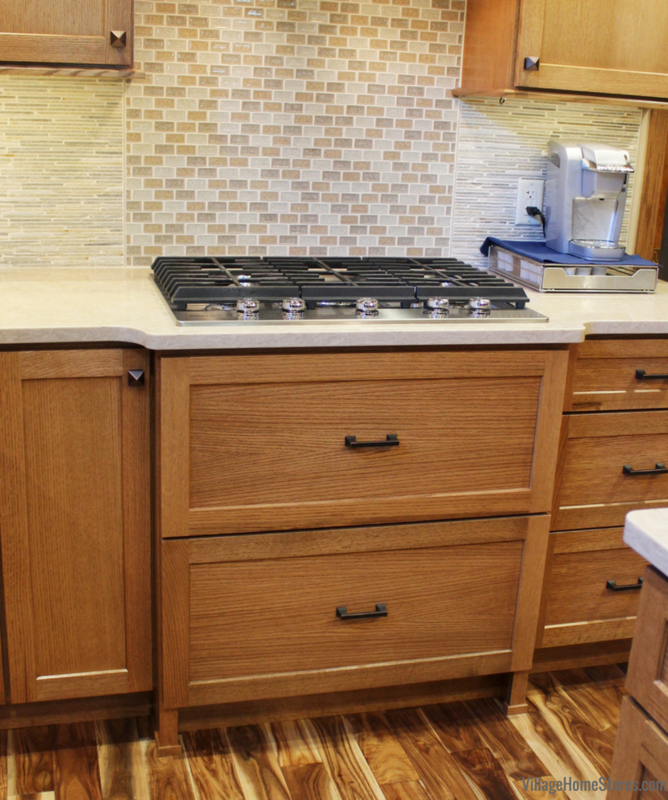 Here is the finished space including Birch cabinetry from our Koch Classic line in the “Vicksburg” doorstyle. Vicksburg is a full-overlay door with a solid-wood center panel. The original kitchen (shown below) included dark stained cabinetry in a U-shape layout with a peninsula area of base cabinets and wall cabinetry suspended above. This created a very crowded feel to the kitchen when in it working or entering it from the front door. 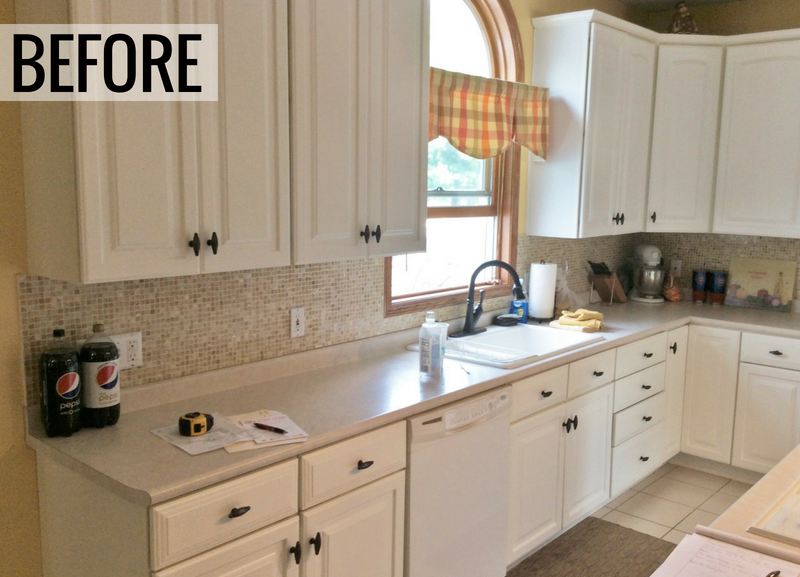 Laminate countertops with a drop-in sink and white appliances were all a part of the old kitchen that was ready for an update. Now the new kitchen is open and incredibly stylish! The back wall of the kitchen has been removed and in its place is a bar-height knee wall with an overhang for seating. 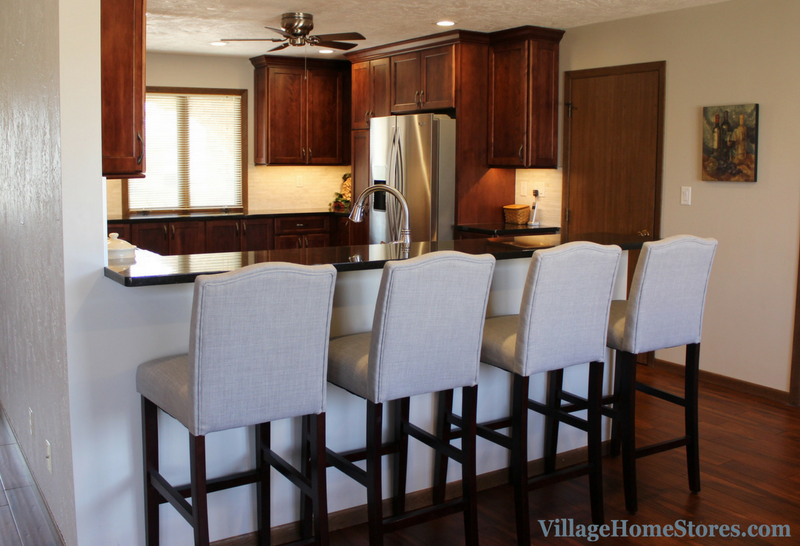 These 4 barstools are just the beginning of the many dining options this entire open concept now has. Outside of the new kitchen are two front rooms, each ready to be considered a formal Dining Room space. Why designate one room as a dining room when the crowd you entertain changes over time? Now that this couple has children and grandchildren coming for meals, they can fill the entire space with tables and seating if needed! Want a better idea of what a jobsite looks like between the before photos and all the beautiful after photos we share here on the blog? 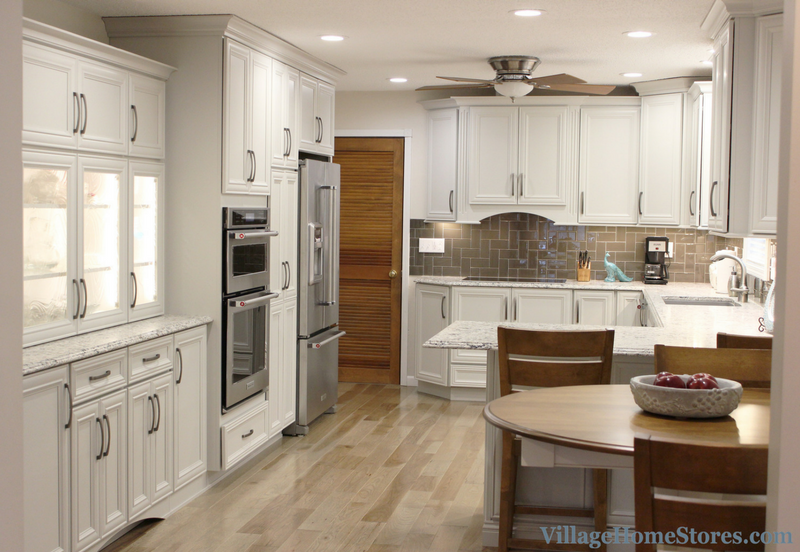 Press play below to watch the episode of the Village Home Show including the entire remodel story from this East Moline, IL kitchen. 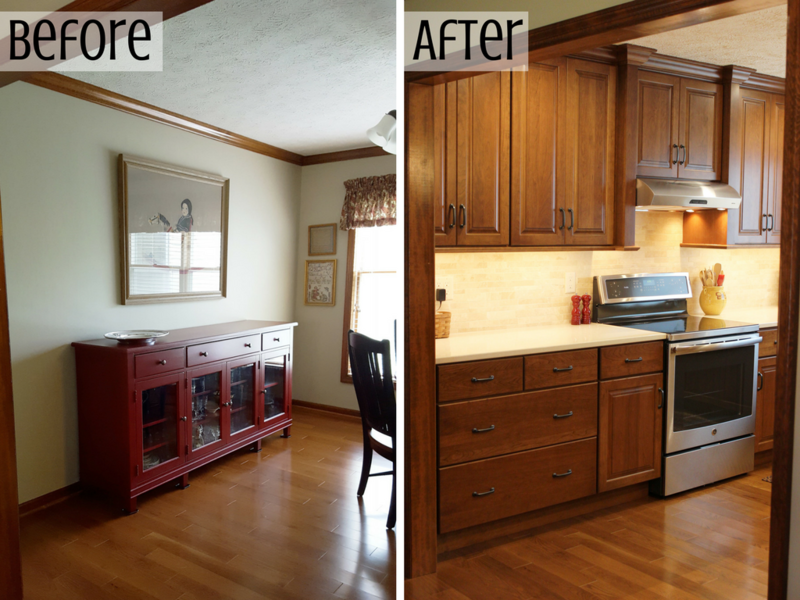 Tour this kitchen with the before and after story plus everything in between. 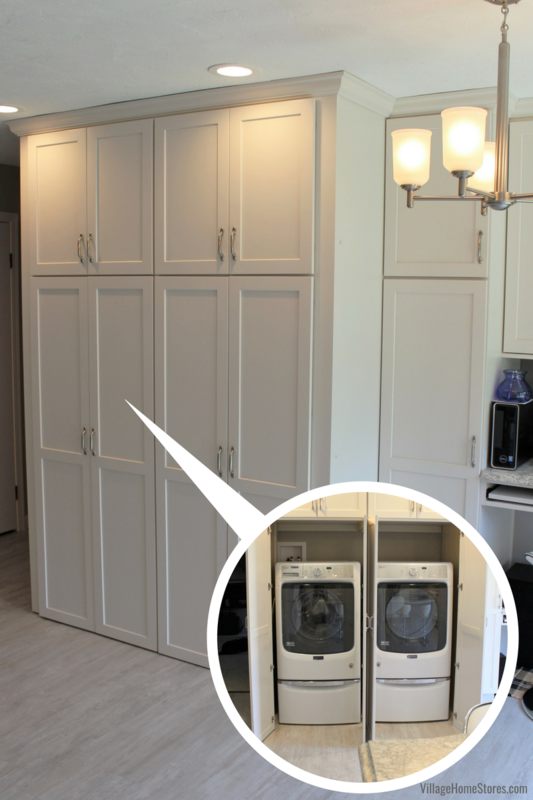 What a difference a fresh new layout can make for the entire main level of this home! As youi saw in the episode, we installed new wood floors throughout. 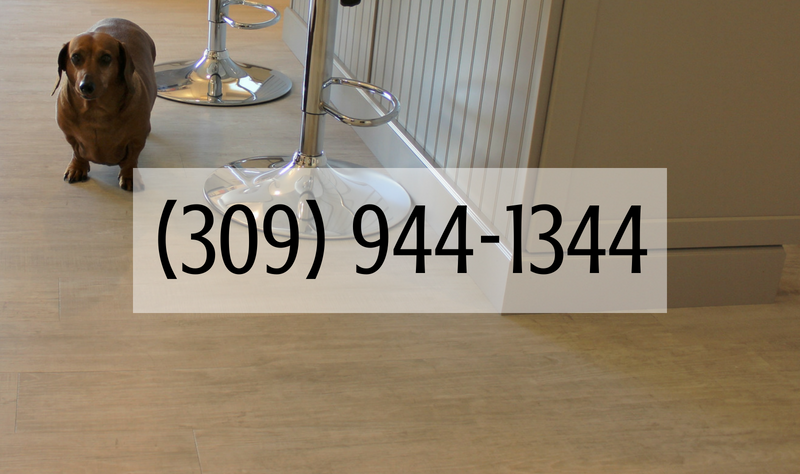 Depending on the flooring material and the project itself, your floors may need an extra layer of protection during the remodel process. In the case of this East Moline home a heavy-duty temporary floor protection is used named Ram Board. 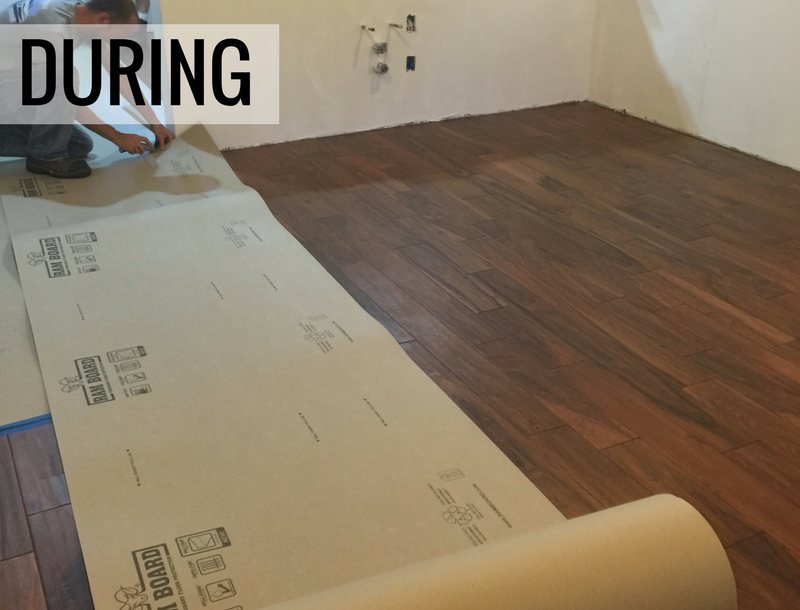 The Paramount Acacia hardwood flooring is installed and almost immediately after installation the durable floor protecting paper goes over it. The next few weeks of this kitchen floor’s installed lifespan will be it’s most challenged. That is why we take no risks of a scratch or a dent as crews work atop the new floors. We even left this Ram Board in place while filming the kitchen for the show. Once everything is finished and the appliances have been delivered and installed, the Ram Board is removed to reveal your new flooring. This Acacia is from the Bucks Country series in the “Teak” finish. 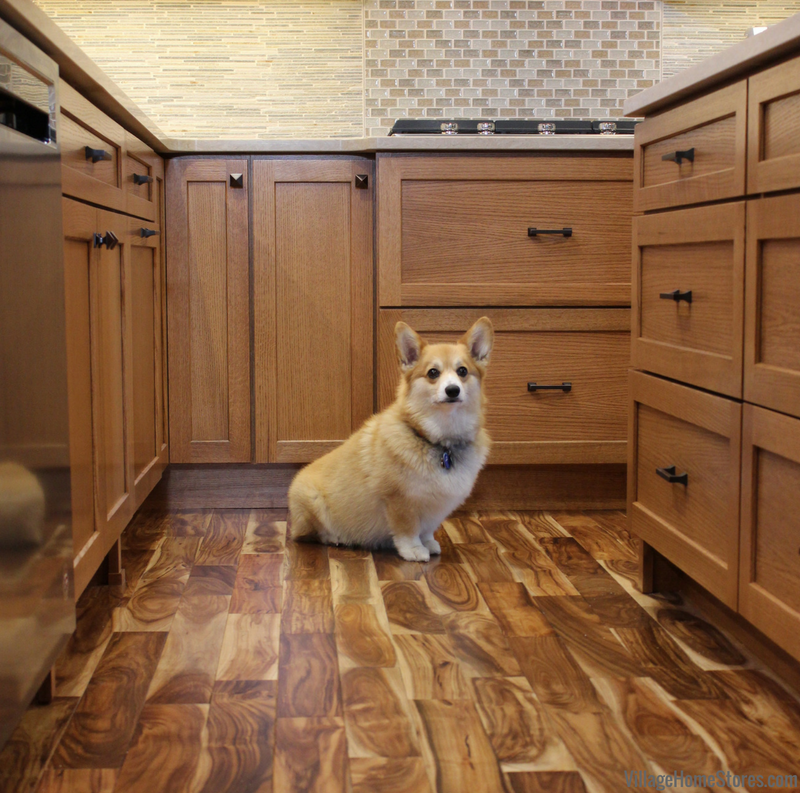 The flooring finish is a great compliment to the kitchen cabinetry. 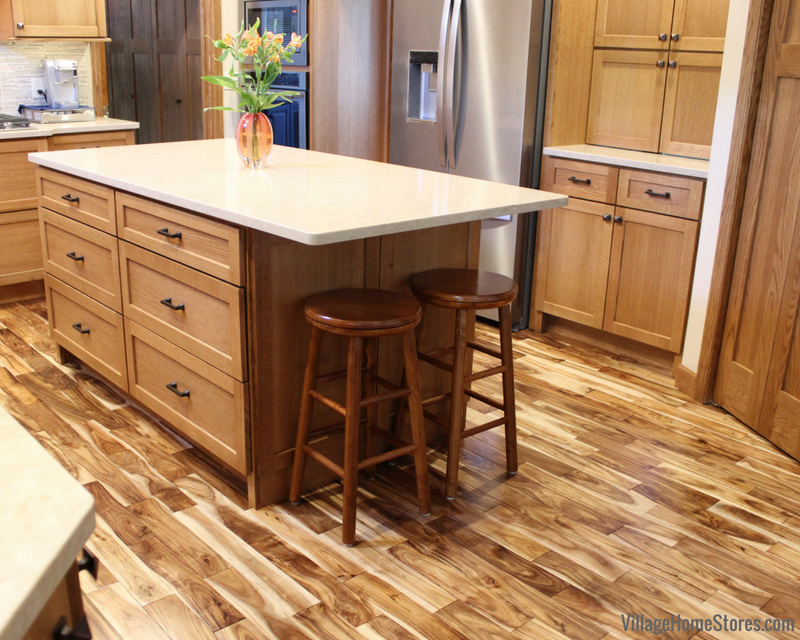 The darkest areas of the flooring color are a great match to the Birch “Brandy” stain on the cabinets. 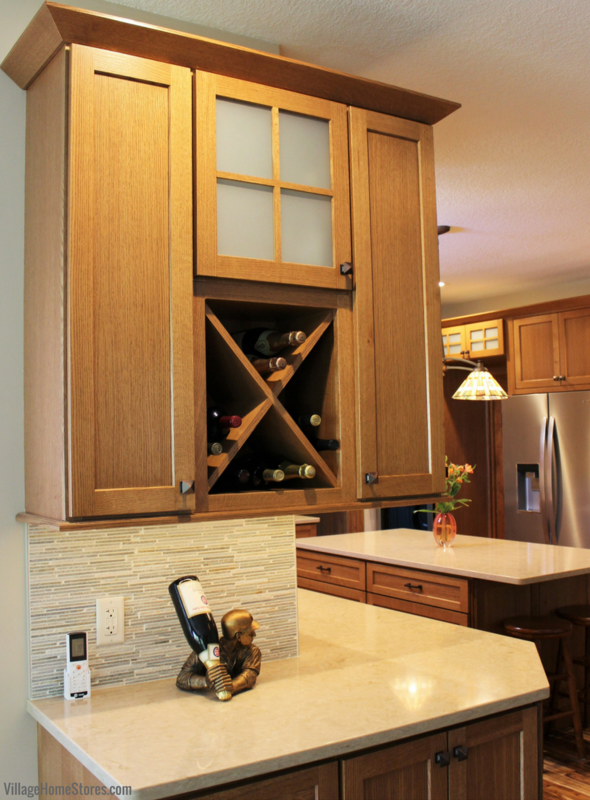 Our favorite corner of the new kitchen is this lighted glass-door cabinet with wine storage. 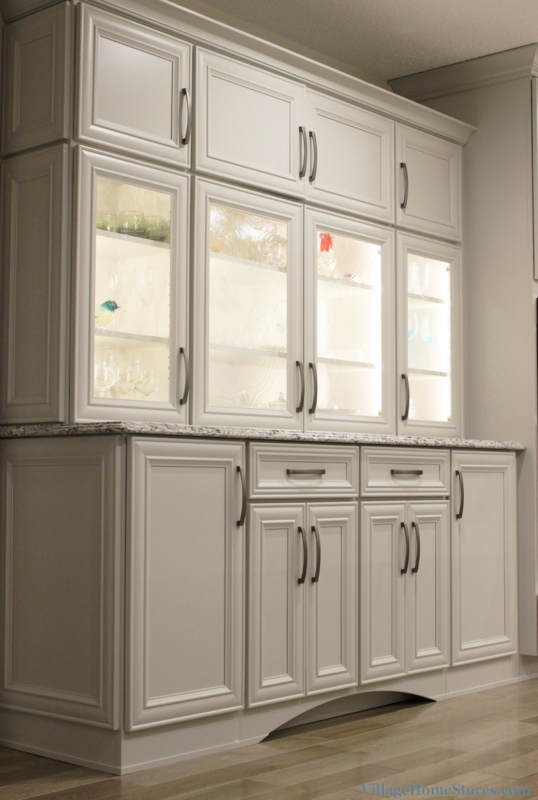 Glass shelves allow the LED lighting to wash the interior of the cabinet with light. 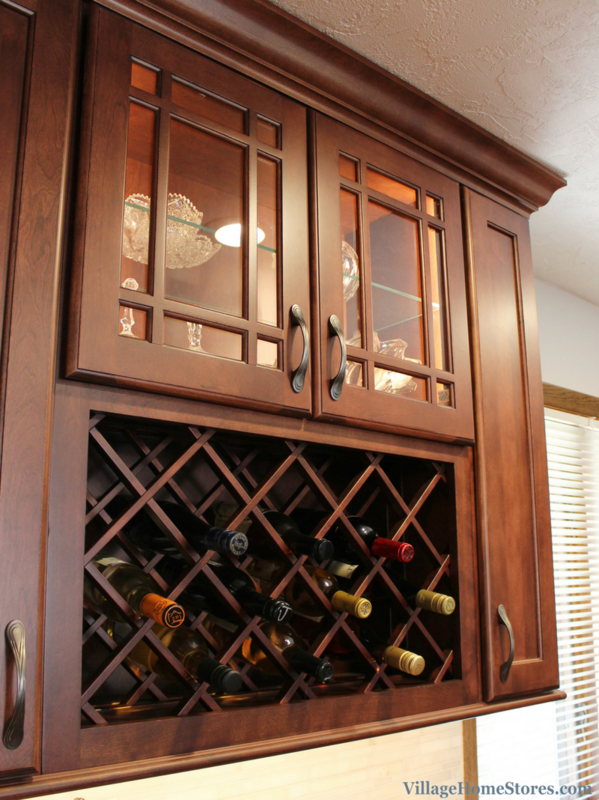 A decorative winerack below can house plenty of bottles. 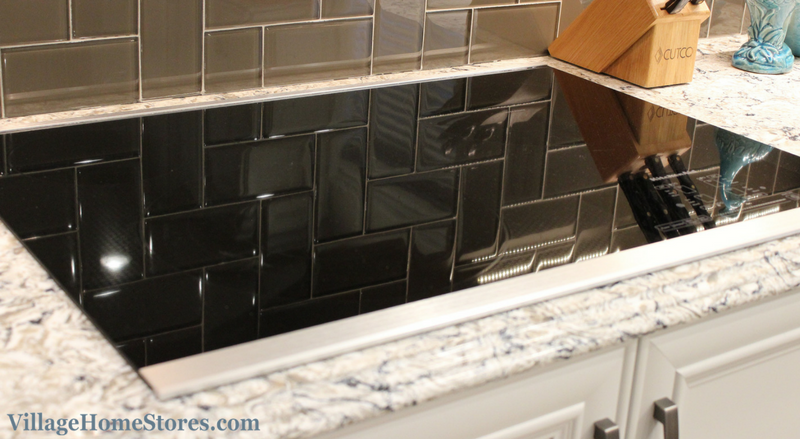 Grecian white interlocking marble mosaic tile reflects on the new polished “Black Pearl” granite counters. 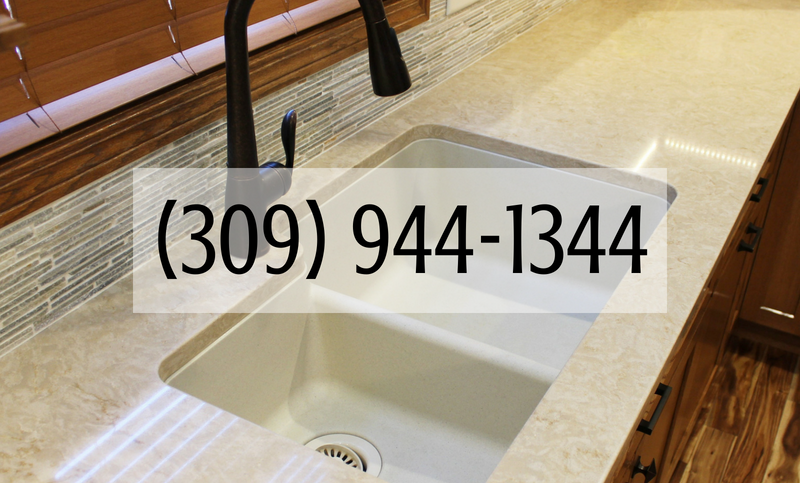 There are many who think selecting a dark granite top for their project might make a room seem very small when paired with dark cabinetry. 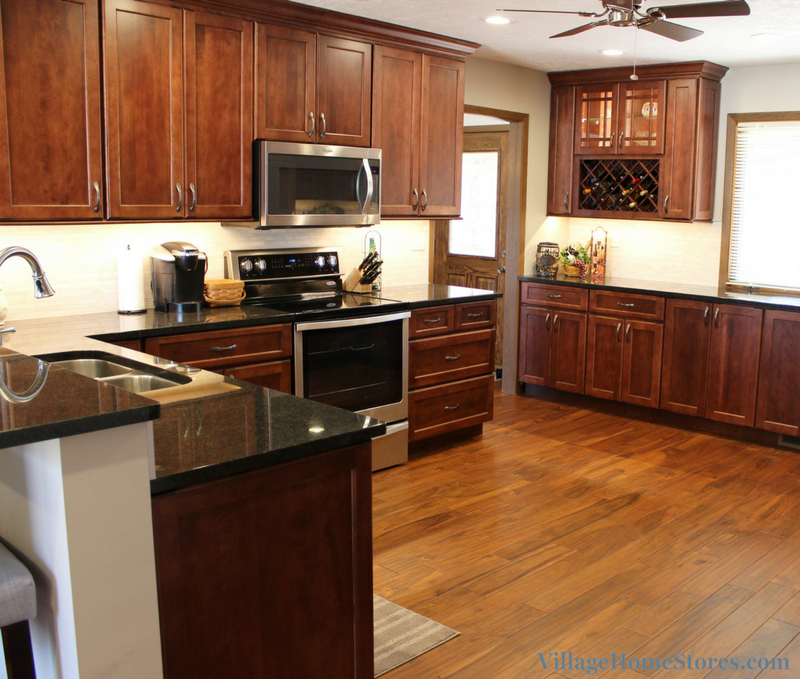 In this East Moline, IL kitchen, the finished combination if gorgeous! Rich, polished stone and a Birch wood with a rich Cherry look. The finishes in this now opened space are perfection. With the wall removed and the kitchen opened up into the nearby Dining Room area, the space has plenty of light within it. Opposite the peninsula wall is a large window (show in image above) This natural light teams up with our Diode LED undercabinet lighting system and plenty of new can lights for a bright space day and night. 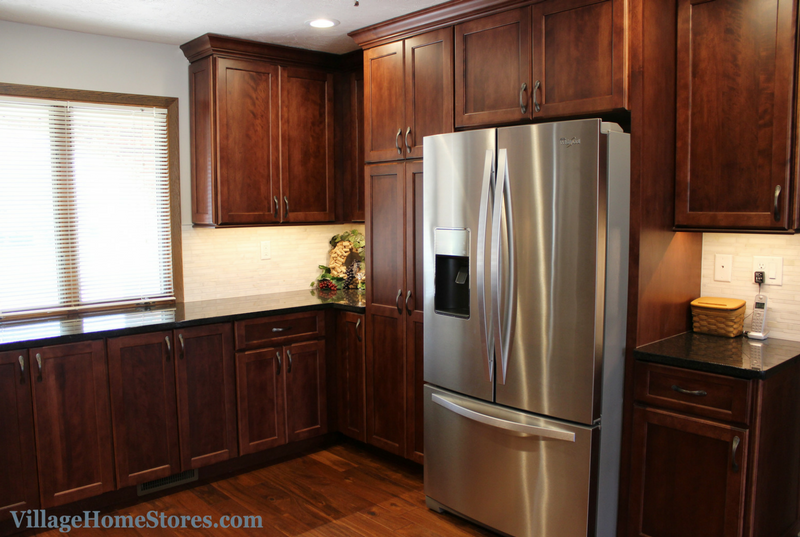 There is plenty of storage in the new kitchen including a tall pantry cabinet next to the refrigerator. 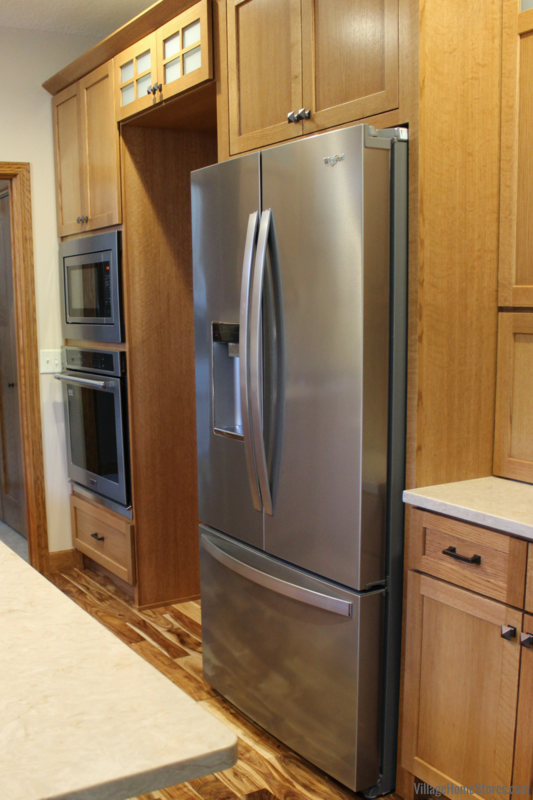 A brand new suite of Whirlpool® appliances in Stainless Steel have been installed in the newly remodeled kitchen. 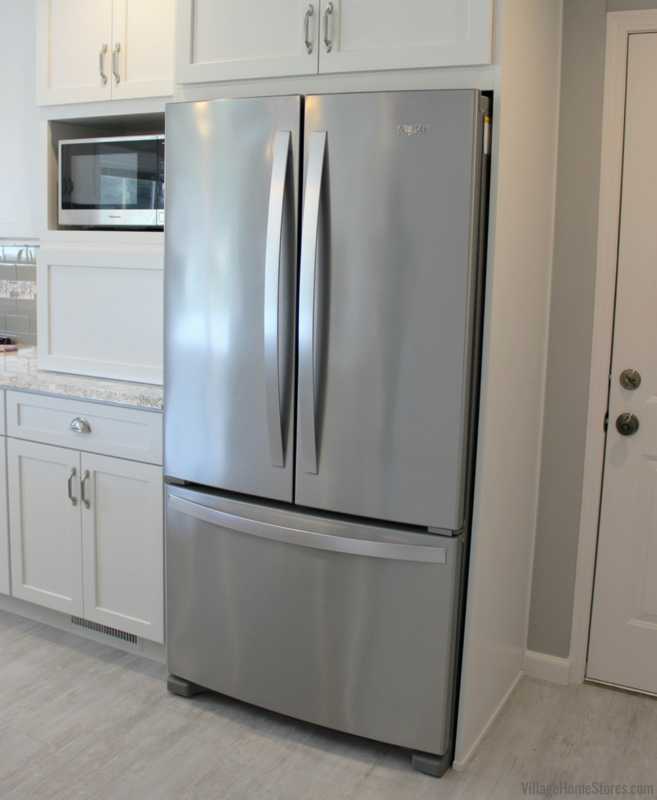 The standard-depth refrigerator includes a full-width temperature controlled wide pantry area behind the french doors. A new freestanding electric range boasts 6.4 cu. ft. of capacity and Convection features. Skip preheating for items like pizza, lasagna, or chicken nuggets! Yes you read that correctly: SKIP THE PREHEATING! This model includes Frozen Bake™ Technology. Just put the items in and then start the oven’s pre-programmed Frozen Bake™ settings. The electric cooktop on this range is very versatile. It includes one front burner with 3 burners-in-one! This FlexHeat™ triple-radiant burner can adjust to a 6″, 9″ or 12″ radius depending on your cookware sizes. 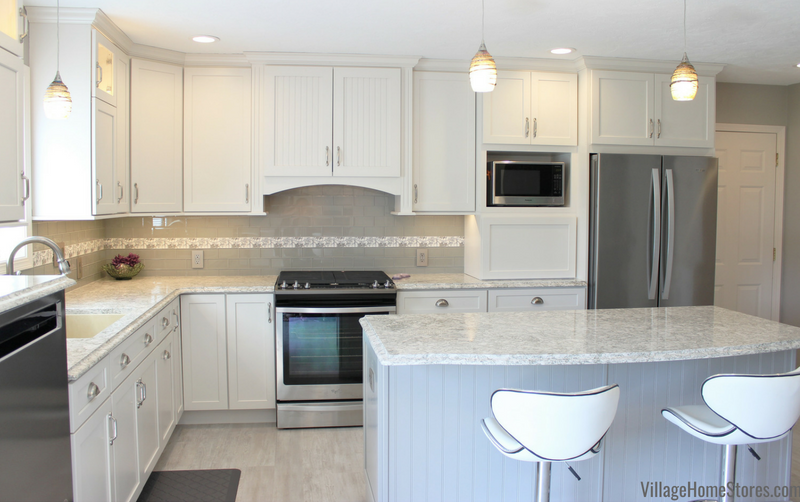 See the full album of photos from this East Moline, IL kitchen remodel here on our award-winning Houzz page. 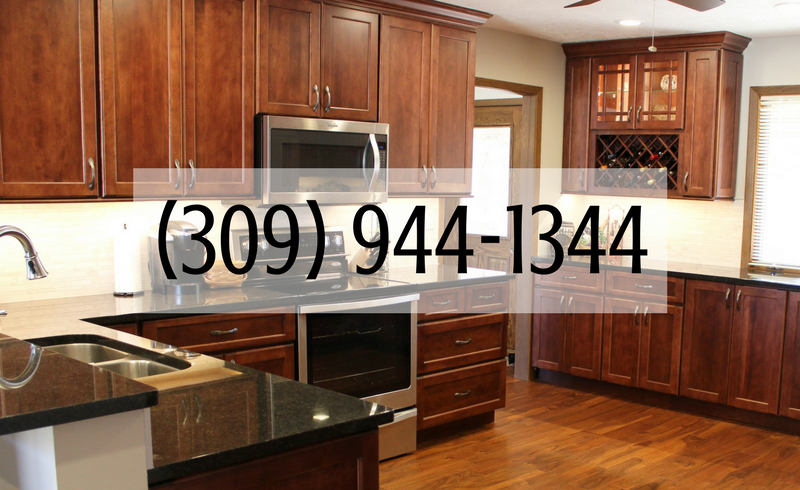 Is there something about this new kitchen that you would like to include in your own project? Feel free to save any of these images to your Pinterest page or start and ideabook using our Houzz images. We want to keep you informed with what projects we are completing in the area and give you ideas to save for your own project with our store in the future. 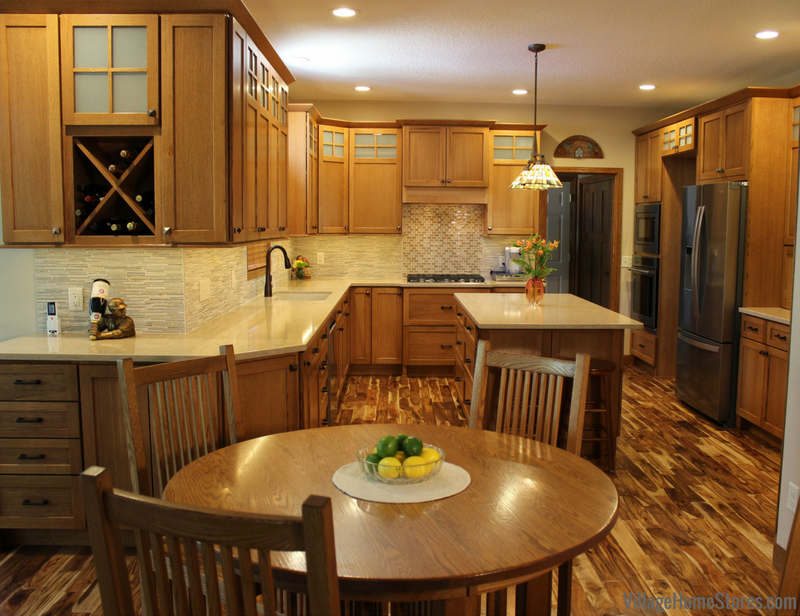 Are you ready to start the conversation about your own kitchen remodel? We can’t wait to walk you through our proven remodel process. We have a unique system that is constantly changing and adapting from project to project to get you the best customer experience paired with quality products. Our team is ready to go to work for you! Your first step is to reach out for an in-store complimentary consultation. 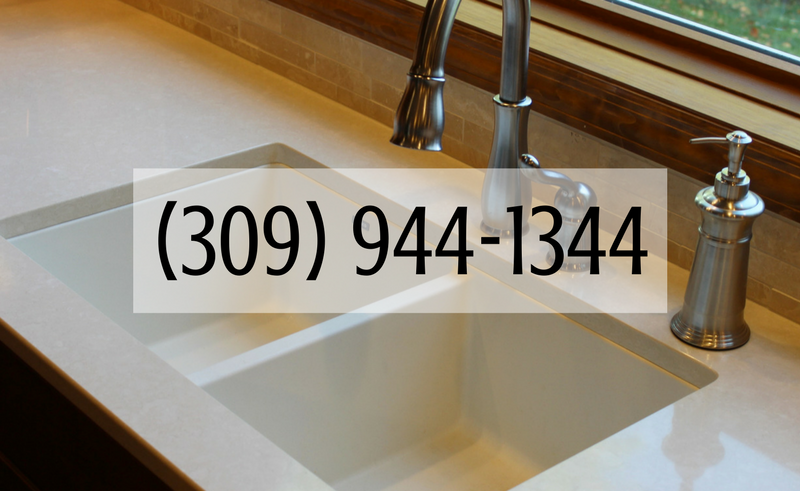 Contact us by completing this online form or calling us at (309) 944-1344. Blue Grass, IA- Go Brighter For Big Results! Many times it is the changes in finishes that can make the largest impact on a space. 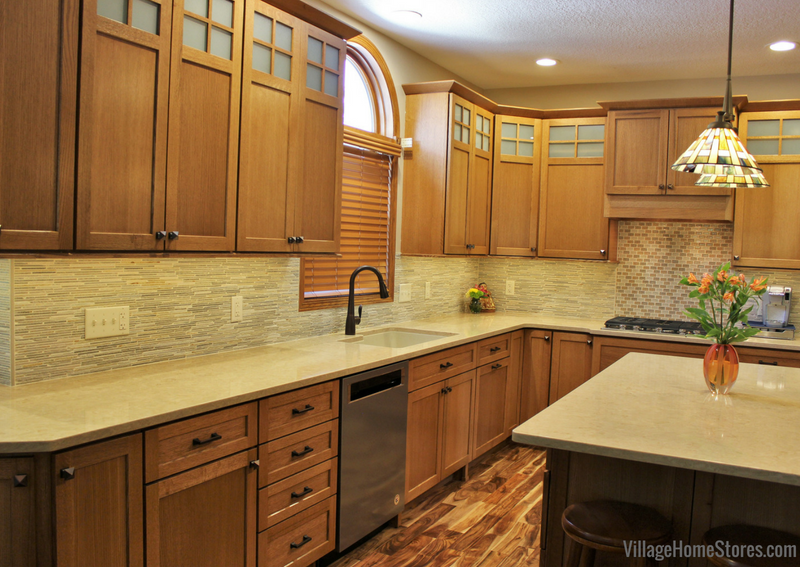 Combine that with a few layout adjustments and additions and you get this week’s featured kitchen remodel tour in Blue Grass, IA. A U-shaped kitchen with a peninsula is extended and made brighter and for big results! Let’s begin with how we “extended” the space and still kept the kitchen footprint the same. A section of wall between the kitchen and the casual dining area was previously used to house a china hutch area. The available hutch area wall has become absorbed into the cabinetry footprint in the new layout. 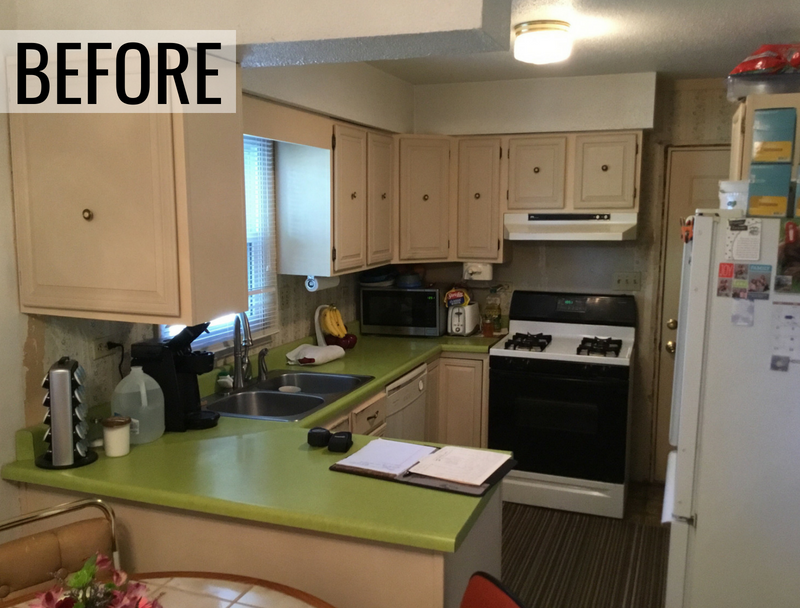 This change plus a shift from medium oak cabinets to a bright, painted look has resulted in a larger look and a bright new space. A peninsula has been installed again to divide the kitchen from the casual dining table but no upper peninsula cabinets were included. 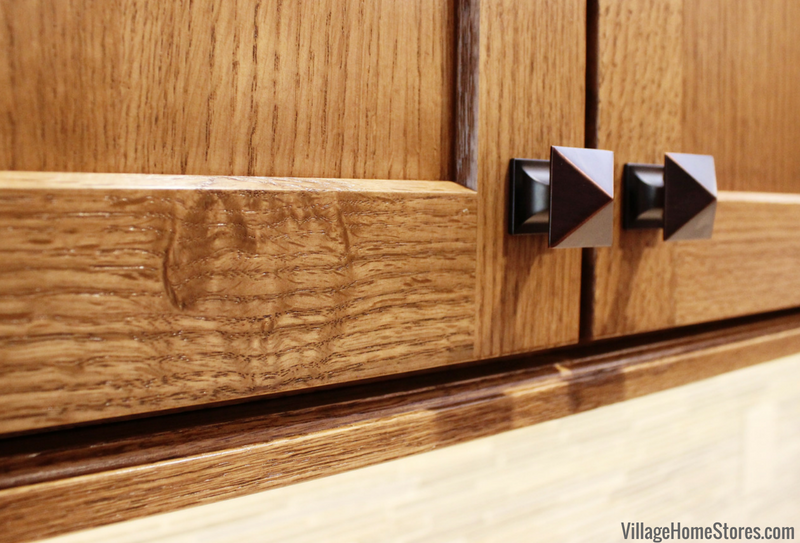 New cabinetry from our Koch Classic line in the Legacy doorstyle and Birch wood finished with the “Oyster” paint. 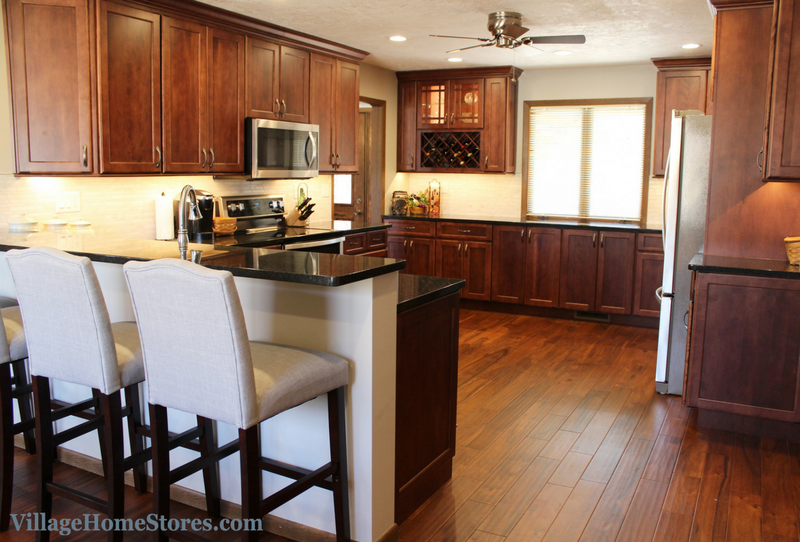 The Legacy door is one of our most popular styles from this cabinetry line. It is such a great detailed door without being ornate or over-the-top. The details are found in the rails and stiles of the door and a flat-panel center keeps the look from becoming heavy or overly Traditional. 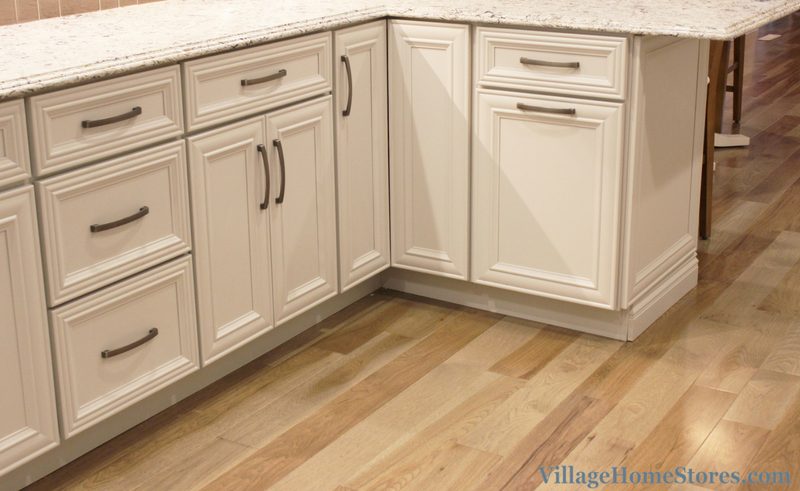 New Hickory hardwood from our Somerset line has been installed throughout. The light wood tone is named “Moonlight” and it is the perfect finish to be paired with the soft, warm grays included throughout the new kitchen. 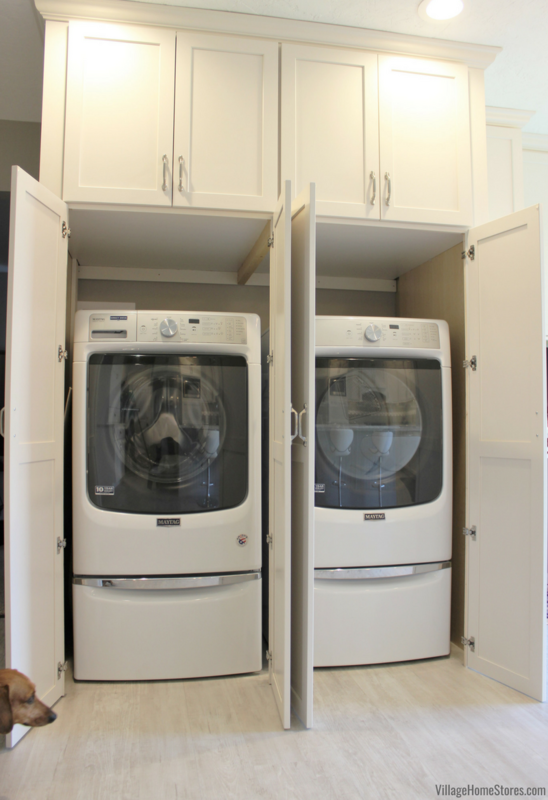 As mentioned before, a new hutch area has been installed in the same doorstyle as the kitchen cabinetry. Including details like an arched toespace valance and adding interior lighting with glass doors to the cabinet help achieve a furniture look. 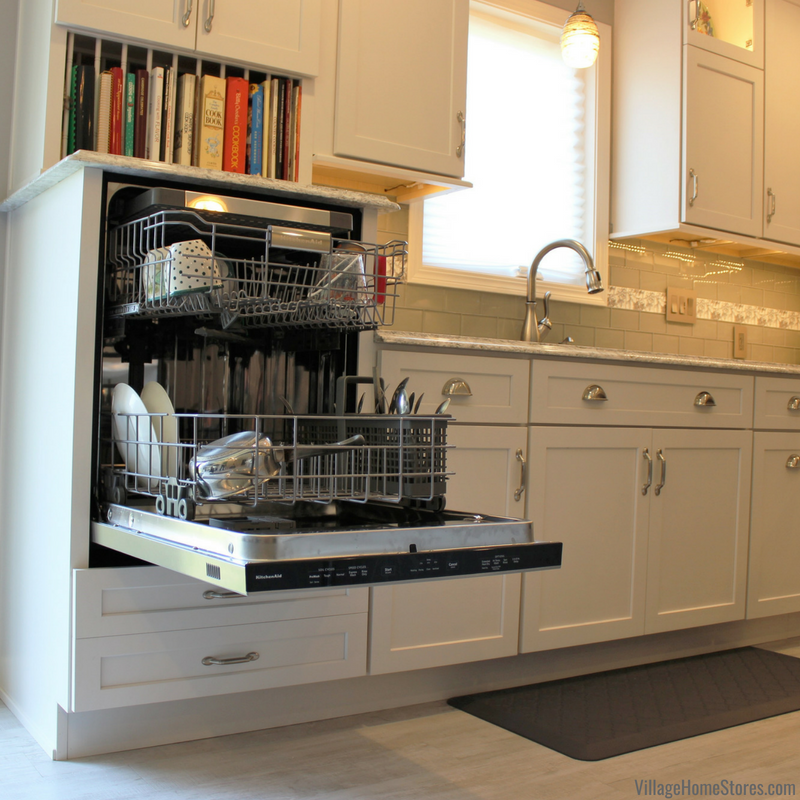 The wall cabinetry in this section also extends all the way down to the quartz tops. Our low-voltage Diode LED lighting system is the perfect choice for an area like this. 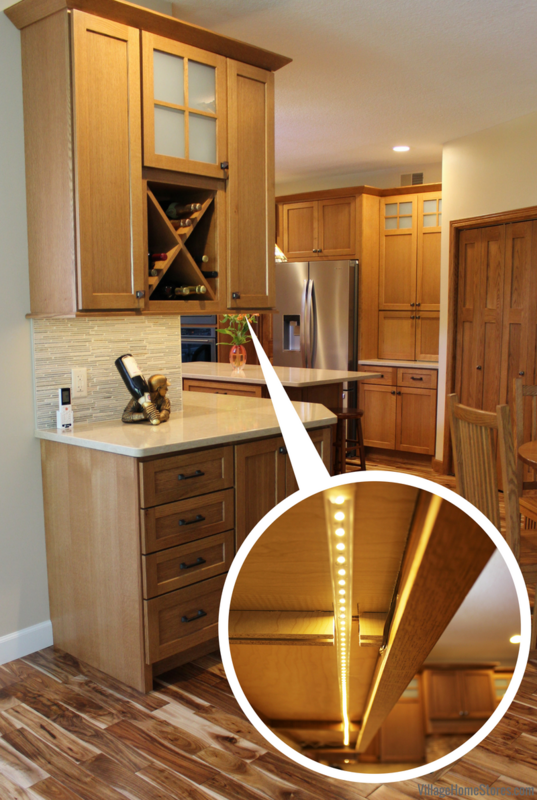 These lights can be dimmed and left on as much as desired using minimal energy. Learn more about this system in a previous post here on the blog. The perfect ambient light when entertaining and even a nightlight in the evening. 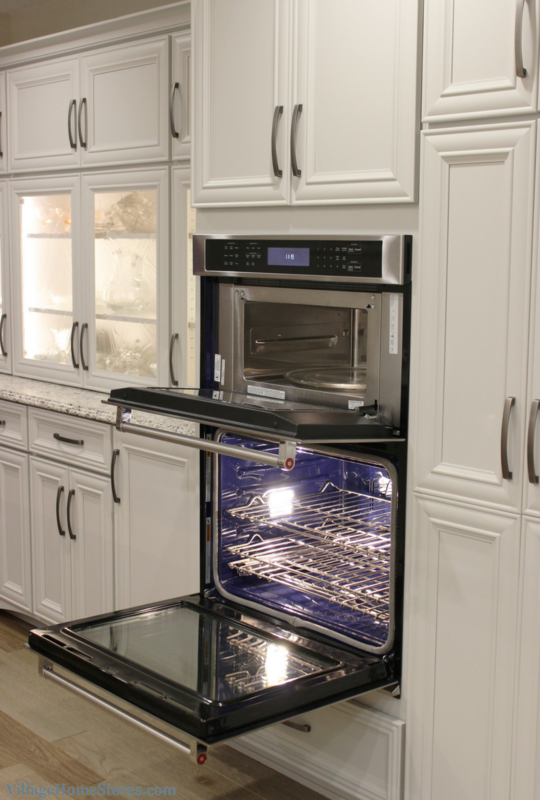 A new appliance package from KitchenAid® has been included in the new kitchen. KitchenAid® offers appliances with professional-inspired styles including incredible features and function. A 30″ wide Combination Microwave and Wall Oven is full of incredible features like Even-Heat™ True Convection in the lower oven for consistent baking temperatures and faster preheat times. The Microwave above also includes convection features allowing a secondary baking/cooking option and qualifying this model as a double oven. 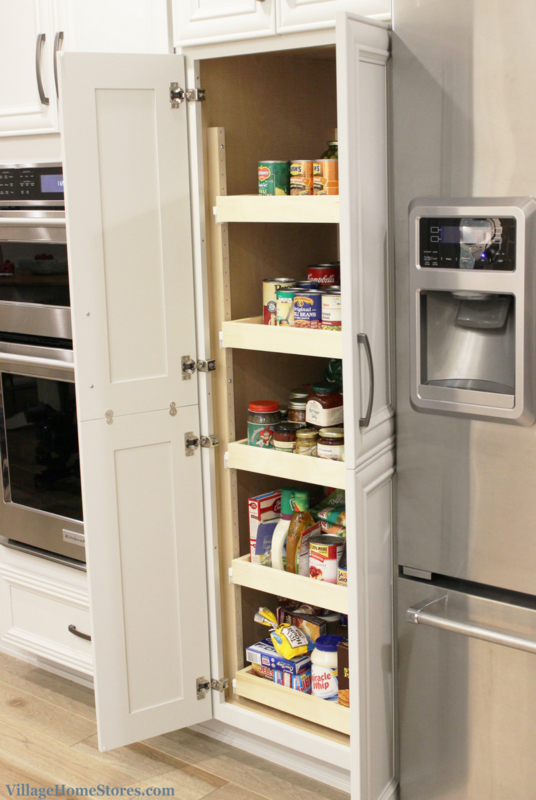 Next to that wall oven unit is a tall pantry cabinet fit with 5 adjustable slide-out shelves. 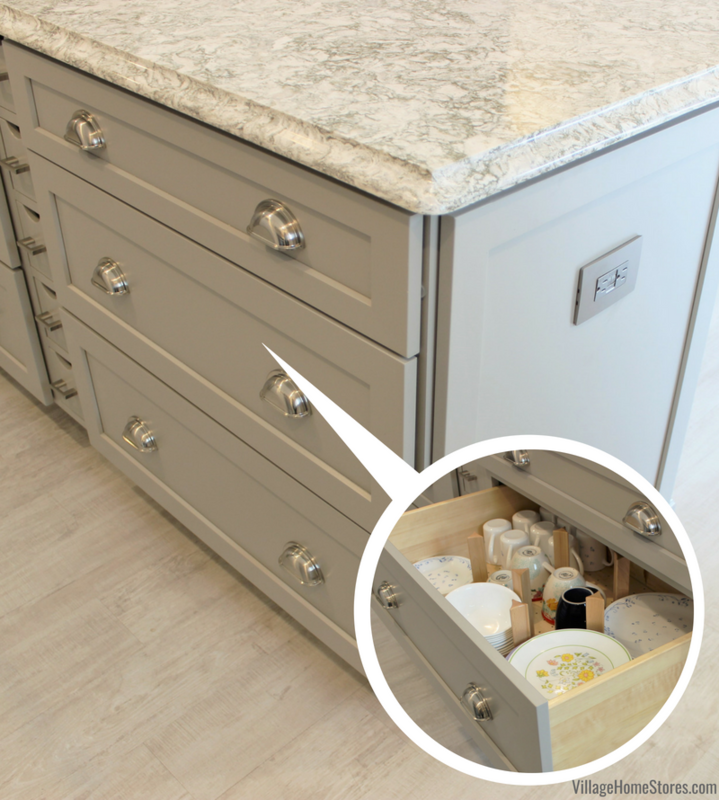 Slide-out shelves from Koch Cabinetry are able to be adjusted in location to fit your own storage needs. Turning the corner in the new kitchen we find the new cooktop area. 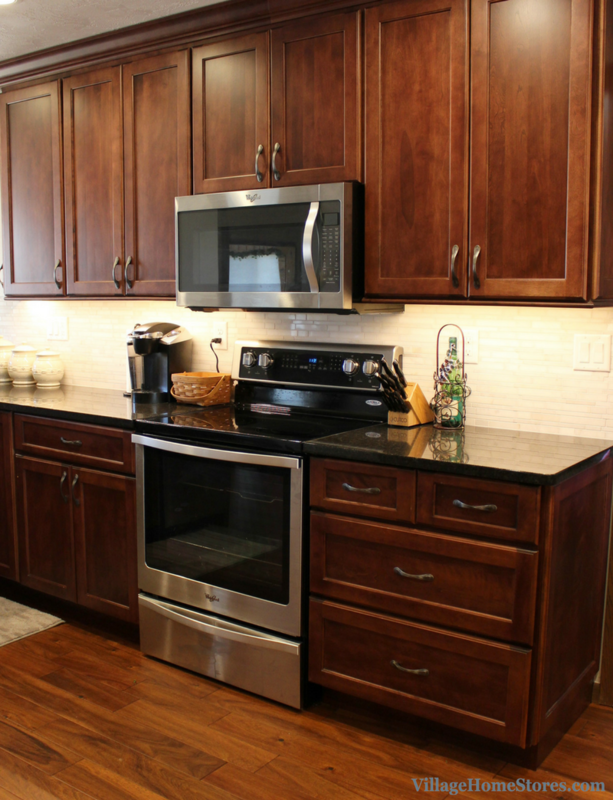 Cooktops can be installed in a number of different cabinets. 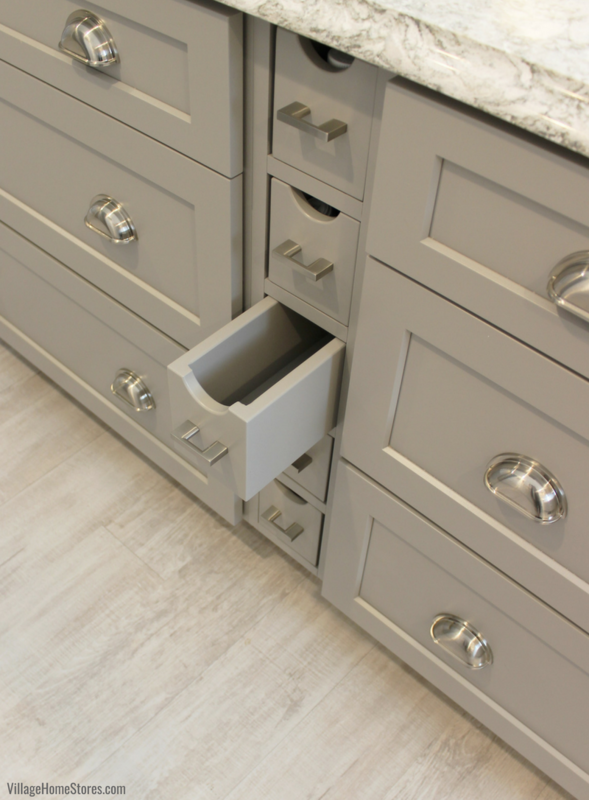 This kitchen includes a “reversed drawer” cabinet that moves the shallow top drawer down to the bottom of the cabinet. 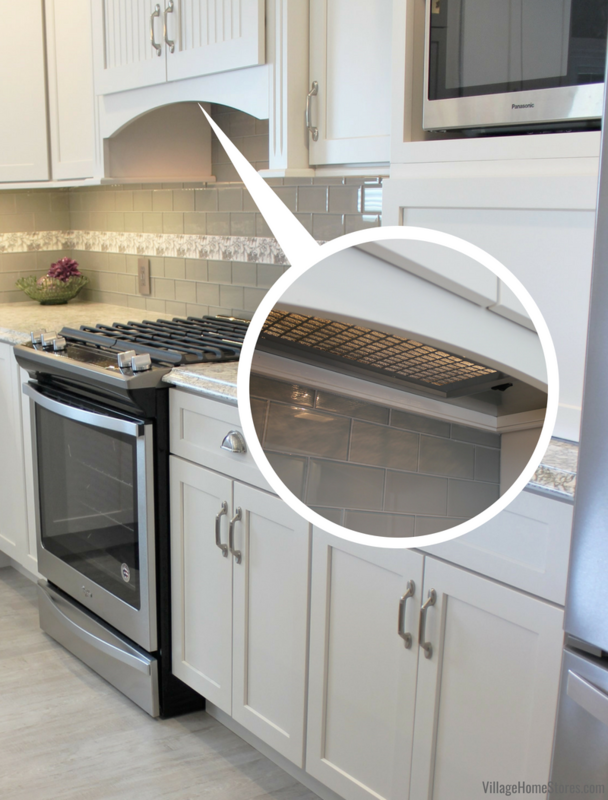 That leaves the top section of the cabinet available for the cooktop components and power source connections. 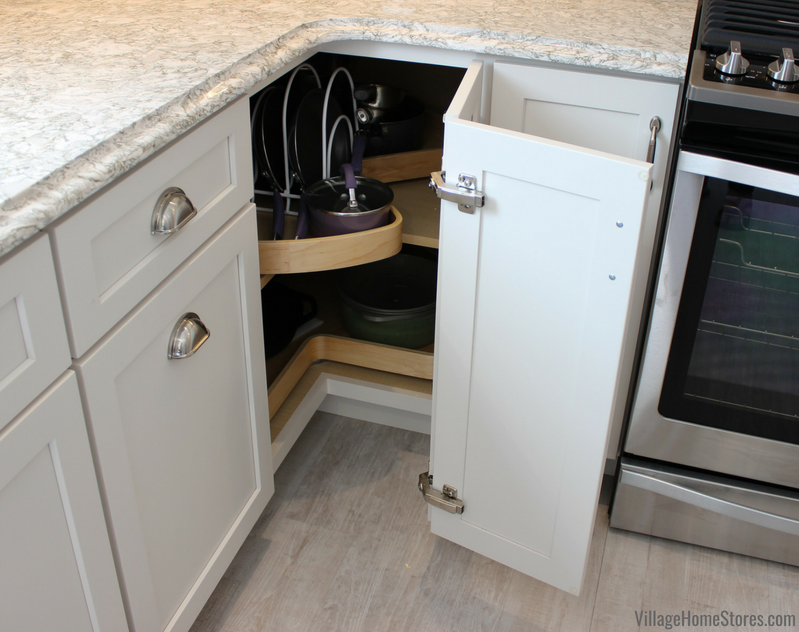 The bottom drawer here is perfect for bakeware or pots and pans lids. 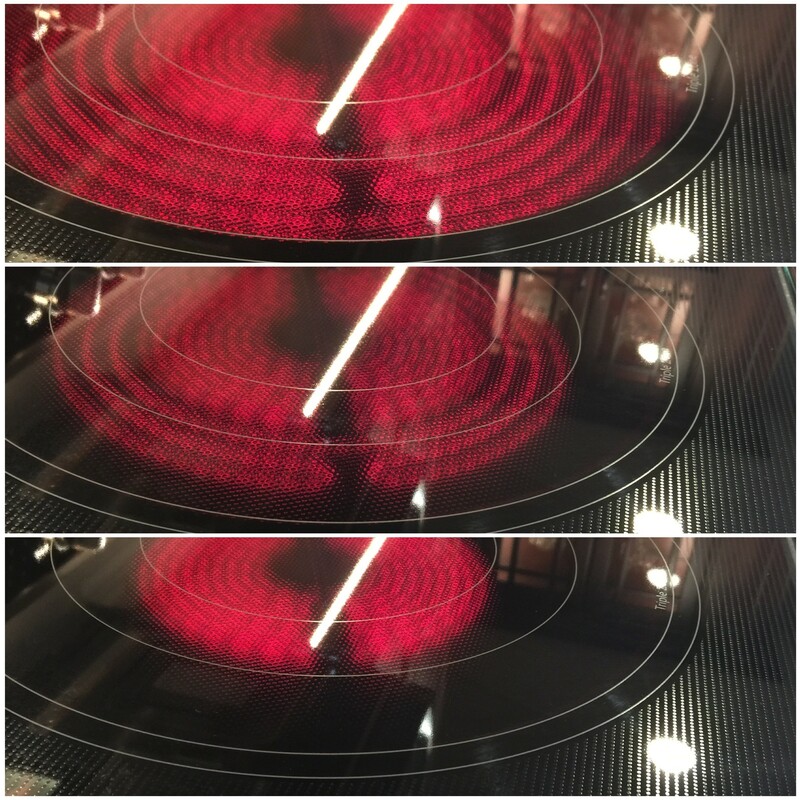 The new 30″ electric cooktop includes tap-touch controls and a very versatile 4-element layout. One of the cooking elements is a triple-ring space offering a 12″, 9″, and 6″ element all in one convenient front location. This gives you many options for cookware all in the same location. 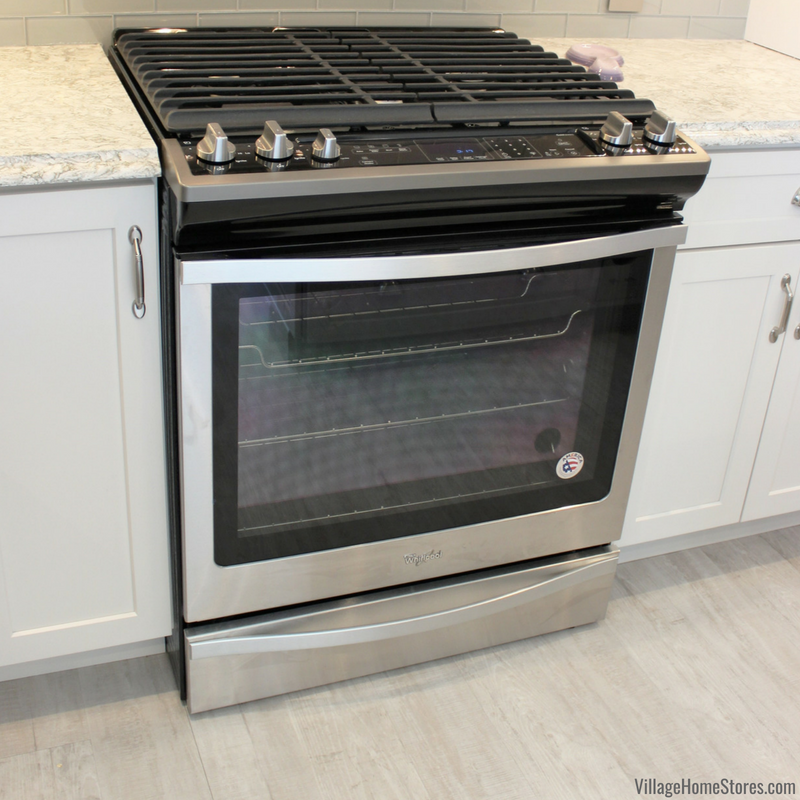 Stainless Steel trim helps compliment the cooktop with the rest of the new appliance package. 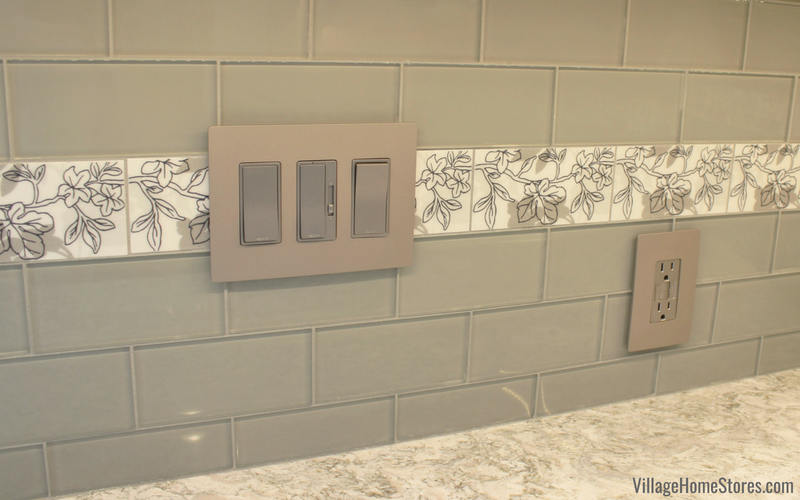 The backsplash tile is one of our favorite parts of the new kitchen! 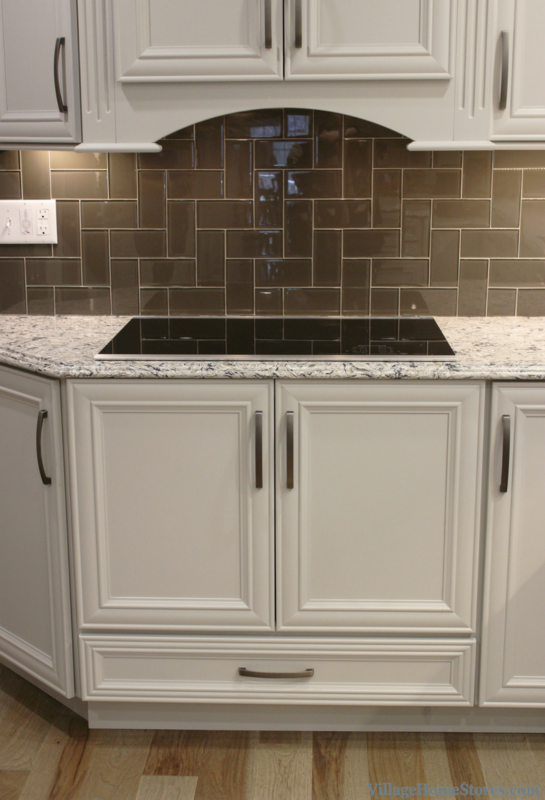 This glass 3″ x 6″ subway tile from our Florstar Interceramic line has been installed in a herringbone pattern. 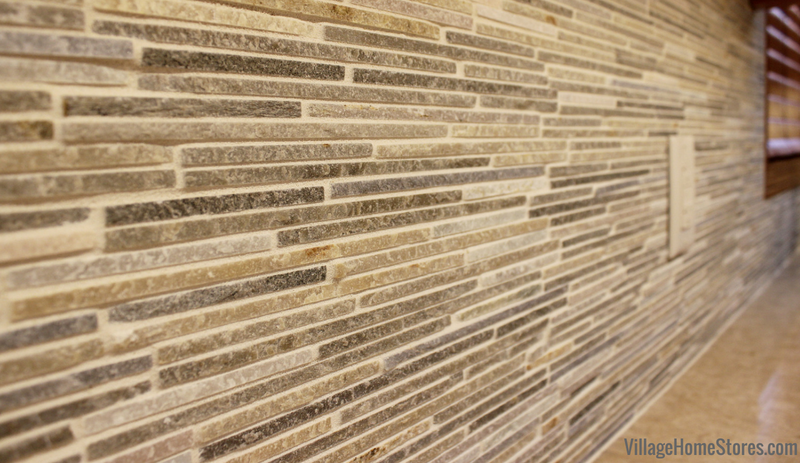 The tile color is named “Shimmer Storm” and the finished look is perfect with the quartz counters. Hardware and lighting have been installed in a Pewter finish. 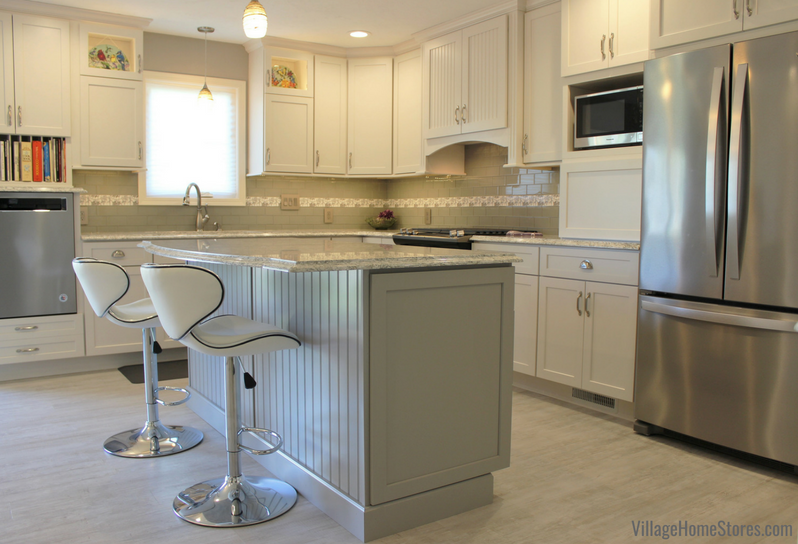 Pewter is a wonderful finish to pair with Stainless appliances in a Traditional style kitchen. The look of these “Merrick” style handles is just as though a highlight of black accent has been applied to a Stainless finish. 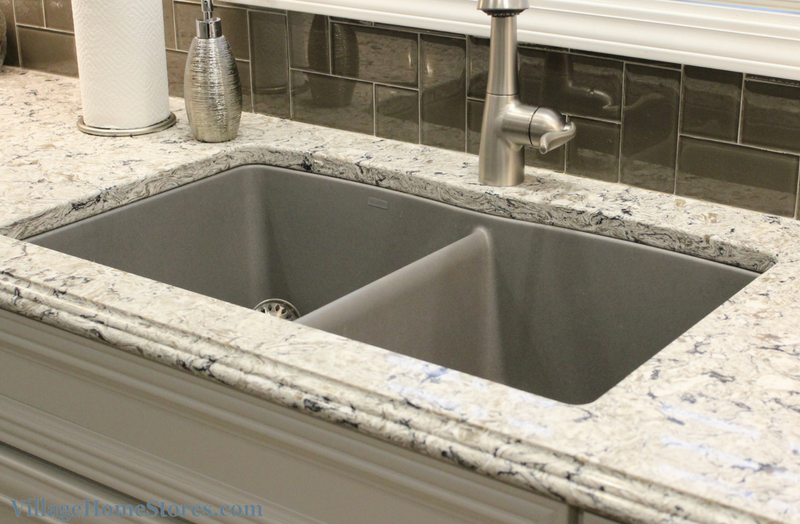 In place of a Stainless sink, a granite composite sink in a “Metallic Gray” color has been undermounted to the tops. 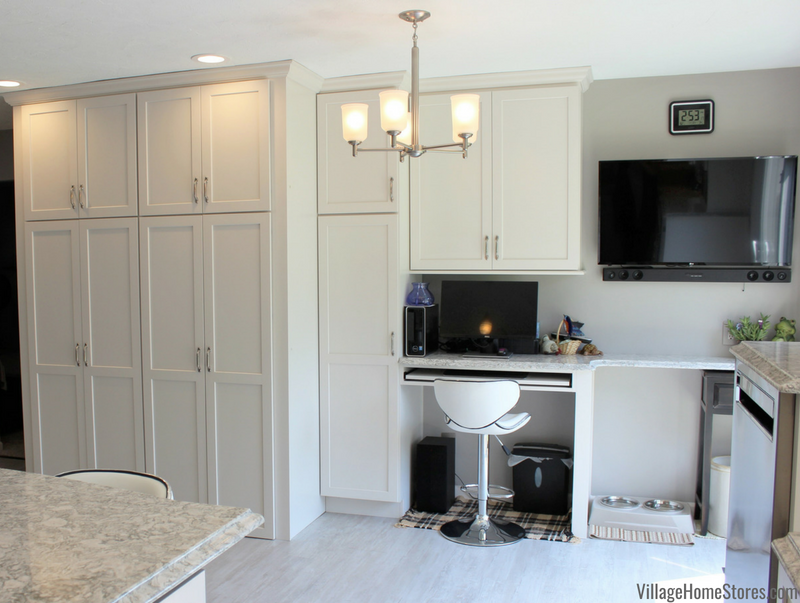 You can watch a full video tour of this remodel project on a recent episode of our show the Village Home Show. In this episode we also share how using apps like Pinterest and Houzz can help get you and your designer from Village Home Stores organized. See the full album of photos from this project here on our award-winning Houzz page. 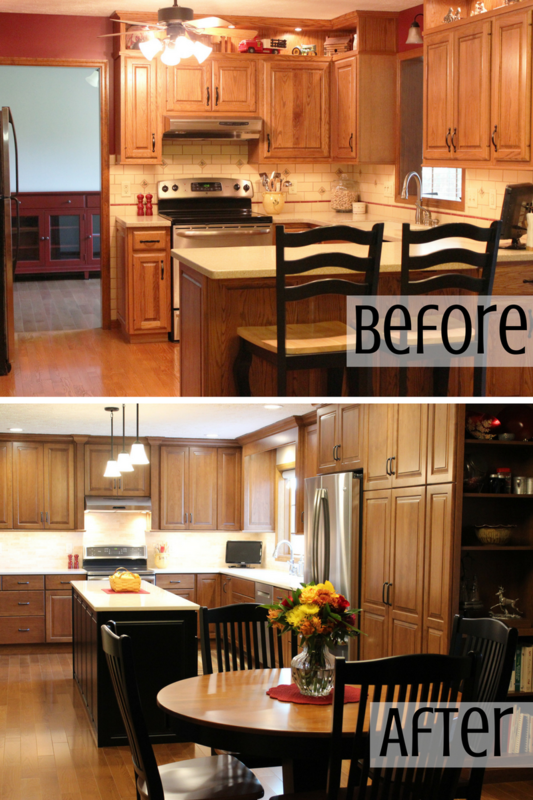 Press play below to see this kitchen plus another local kitchen transform! What a transformation! From dark and crowded to bright and spacious! Are you ready to make the most of your own kitchen space? 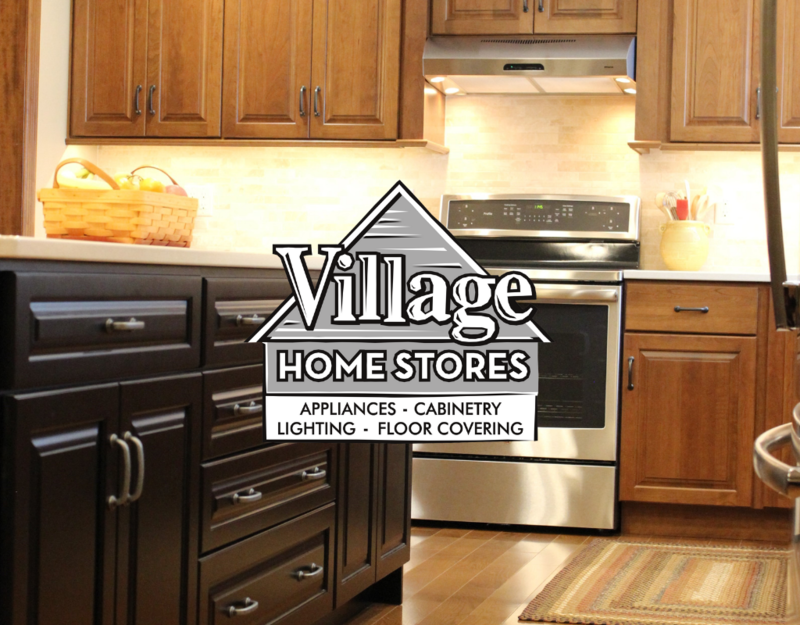 Village Home Stores is ready to partner with you on that project. Your first step is to reach out for that first appointment with our team. 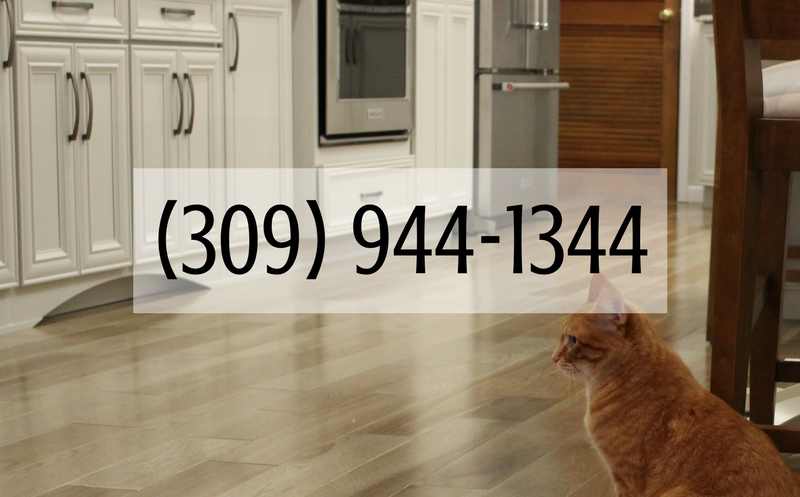 Contact us anytime during store hours at (309) 944-1344 or by completing this short online form. We will then work with you to walk you through our process. We can’t wait to hear what you are working on! 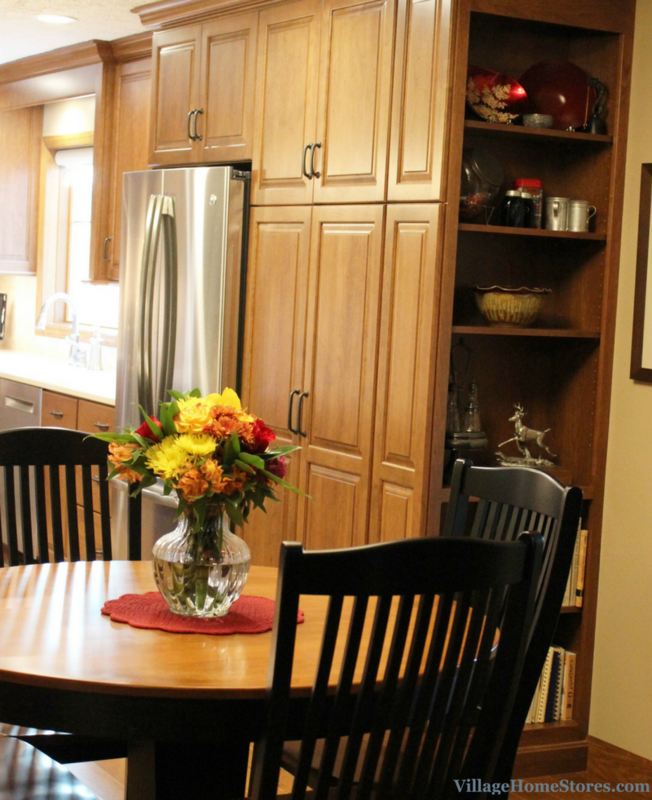 This Davenport, IA kitchen has been completely remodeled to extend its footprint into a nearby dining room. There is now plenty of space for a long L-shaped layout with a large island. 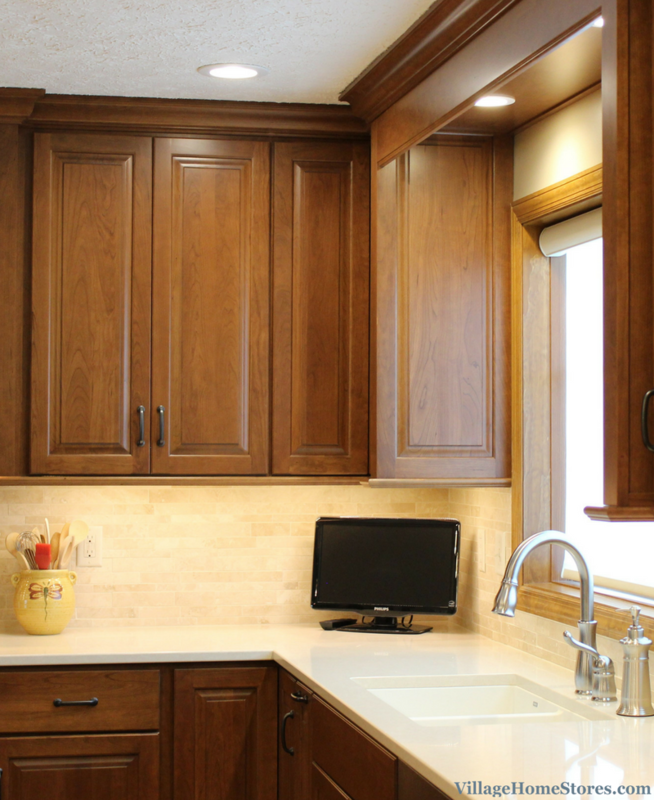 Warm Cherry cabinetry from our DuraSupreme line has been installed in the full-overlay “Kendall” doorstyle and “Clove” finish. A “Black” painted island in the same raised-panel doorstyle offers a bold contrast to the kitchen cabinets and new LVT White Oak flooring. With the removal of a wall that divided the original kitchen from the dining room taken out, there is now plenty of space for a large kitchen island. The new island measures over 8 feet in length and includes large drawer storage and doors that open to reveal slide-out shelves within. 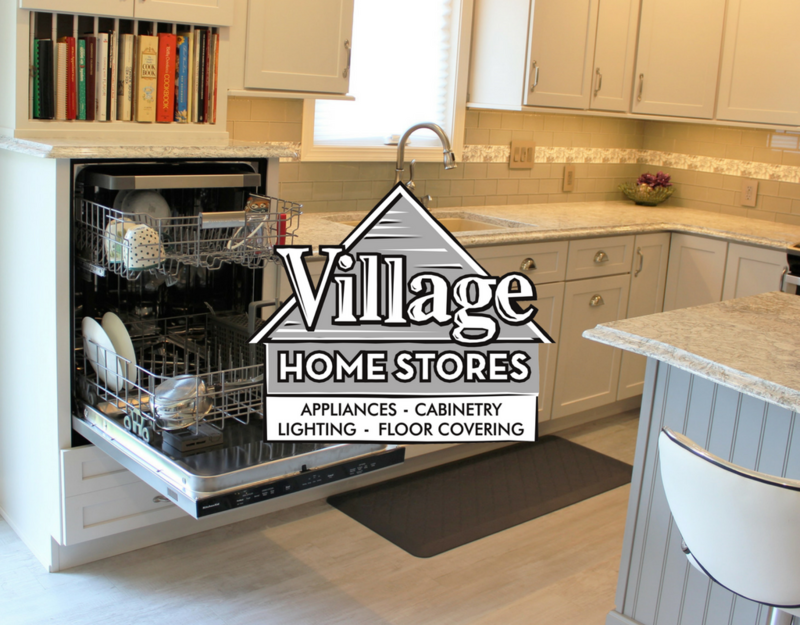 Press play below to watch this entire remodel story unfold on Season 2 Episode 6 of the Village Home Show. 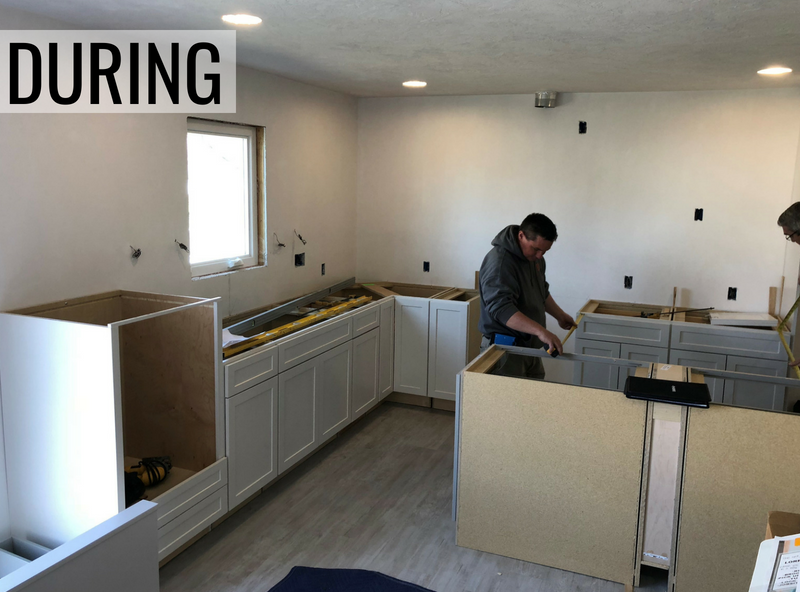 This episode of our show helps to walk you through the entire remodel process from start to finish with us. 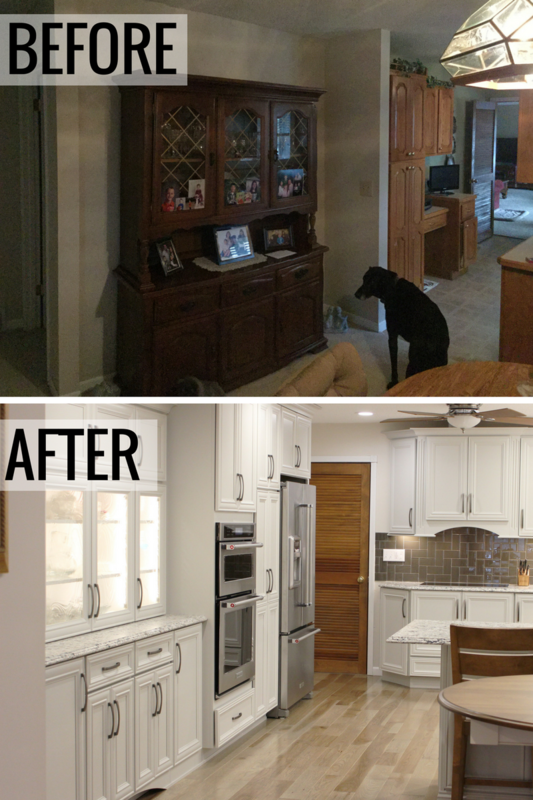 We often share just the before and after parts of a remodel story… but that is not the whole story at all! This episode allows us to return to the jobsite while the real work is happening. 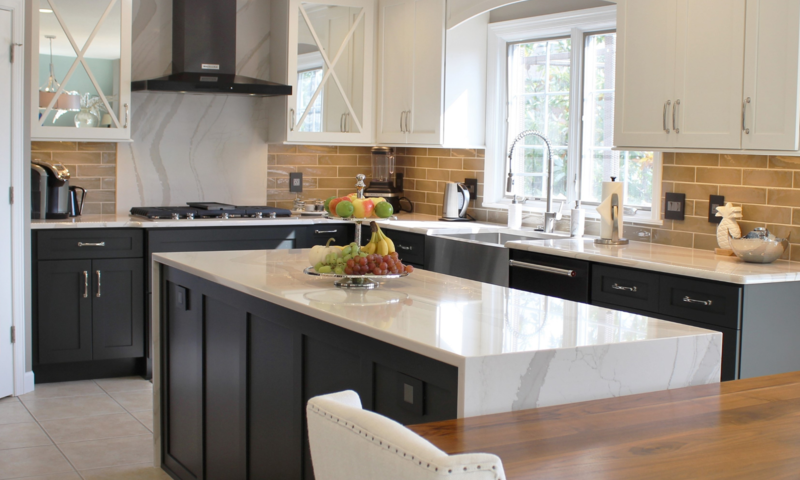 With our show, we are able to give you access to more of the entire story that went behind the beautiful finished kitchen tours we share here on the blog. 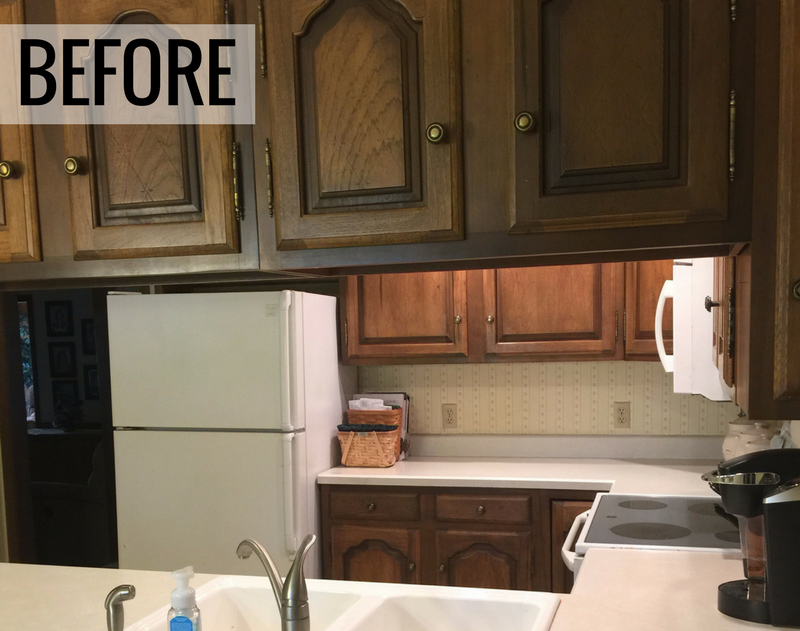 Take a look at the before and after images from this kitchen below highlighting how much more cabinet space is now available with the center wall removed. Because it can now stretch into the original dining room area, this new kitchen design is nearly double what it once was. There is even an area remaining for a casual dining space with 4 chairs. Just because we have absorbed the original dining room as part of the new kitchen, doesn’t mean this home is left without one. An adjacent front room has now been claimed as the new formal dining room area. The before and after image below shows the view into the new kitchen from this new front room dining area. The window that now sits above the sink was far to low in the original dining room to accommodate a kitchen beneath it. A new window was installed at a taller height and now instead of looking up to a pass-through, the sink user gets a beautiful view! The cabinetry surrounding the new kitchen window has been finished with raised-panel ends for an added design detail. Can lighting is concealed behind a matching cherry valance and a cherry dustcover on the ceiling completes this look. 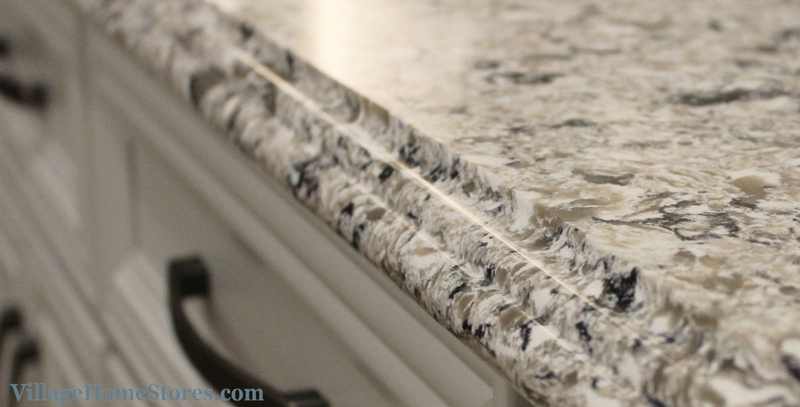 Beautiful Cambria® Quartz counters in the “Fairborne” design are installed in a standard “Eased” edge profile. 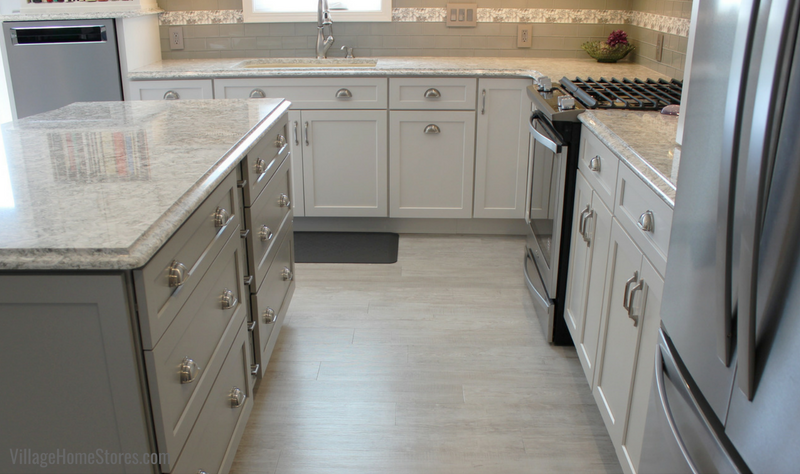 A Tumbled Travertine tiled backsplash is a perfect match in tone adding a new texture against the smooth, polished quartz tops. A 50/50 well sink by Blanco in the “Biscotti” finish has been undermounted to the quartz. 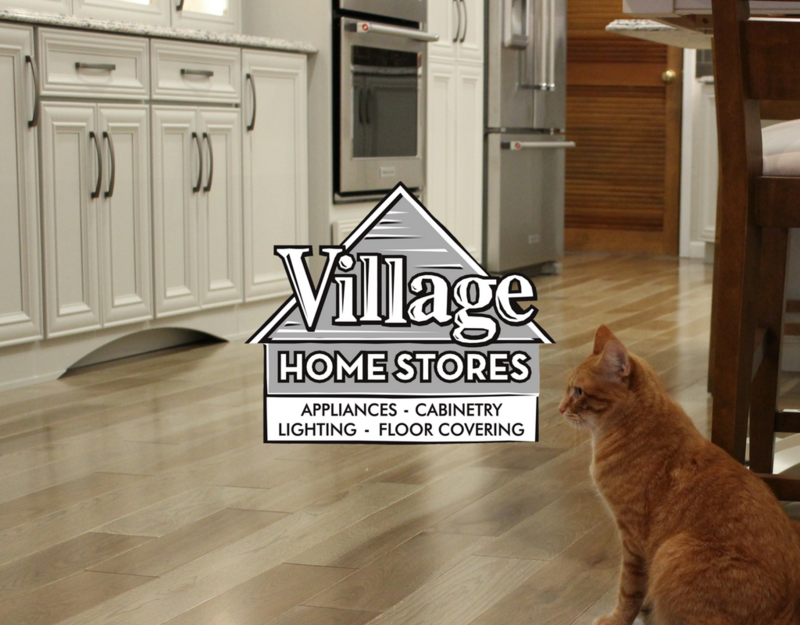 The remodel process with Village Home Stores doesn’t begin on that first demo day. 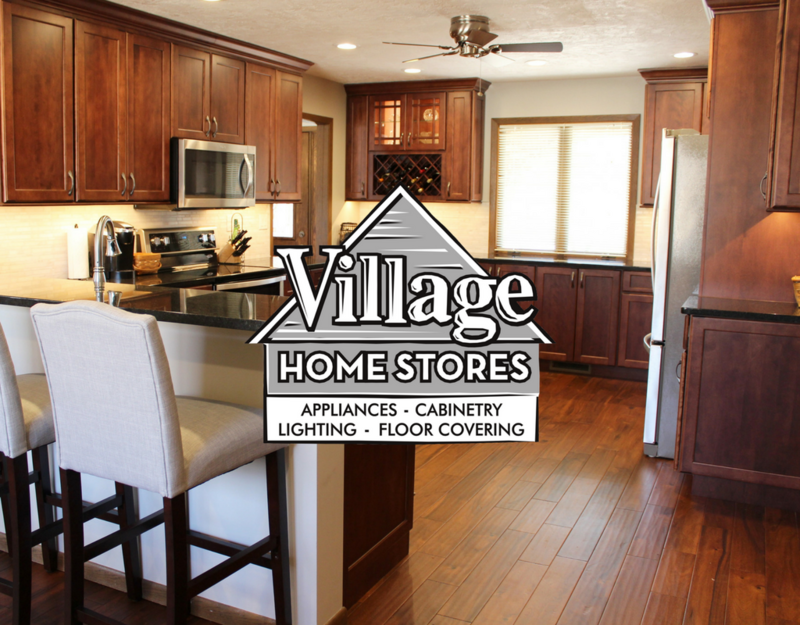 Your remodel starts with us in the store during the designing and material selection phases of your project. 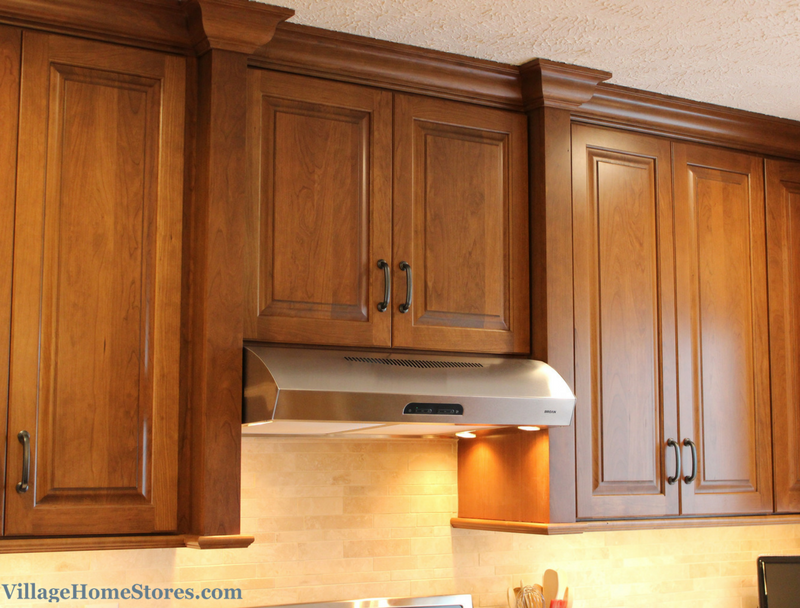 A wood hood look like the one shown above begins as a full-color rendered design you can see in your first presentation from our store. 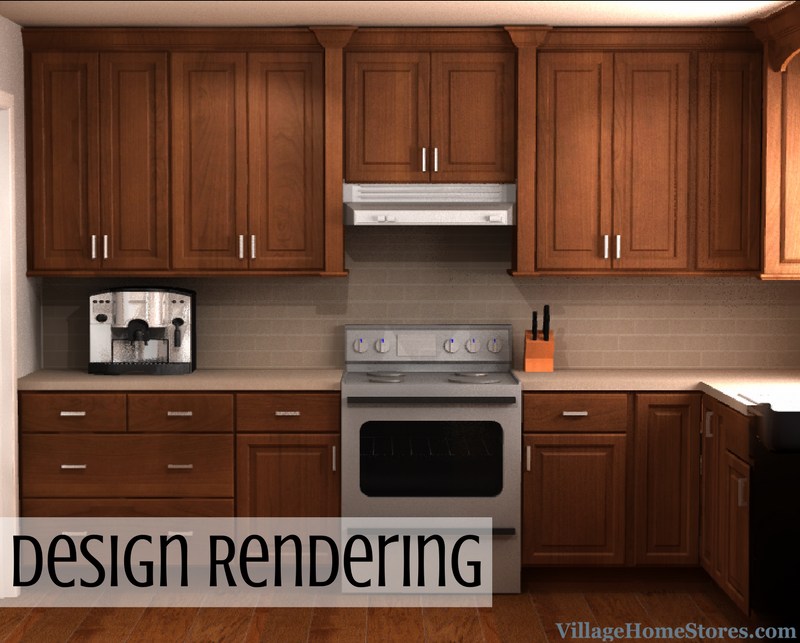 Renderings help you get a better vision for the finished space including the materials you have selected. 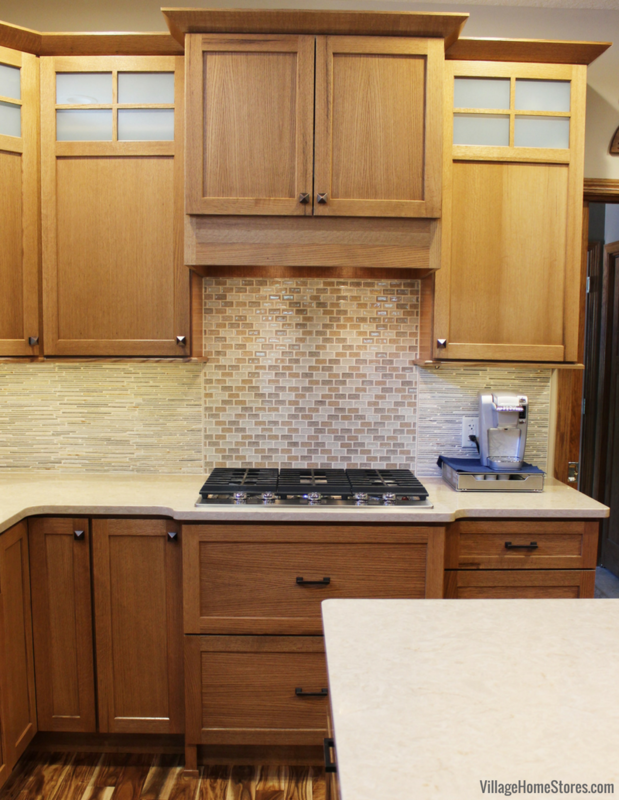 As you will see in the episode, there are plenty of specialty cabinets within this kitchen design. Dura Supreme offers a wide variety of pull-out options including knife blocks, spice racks, and this towel bar cabinet. 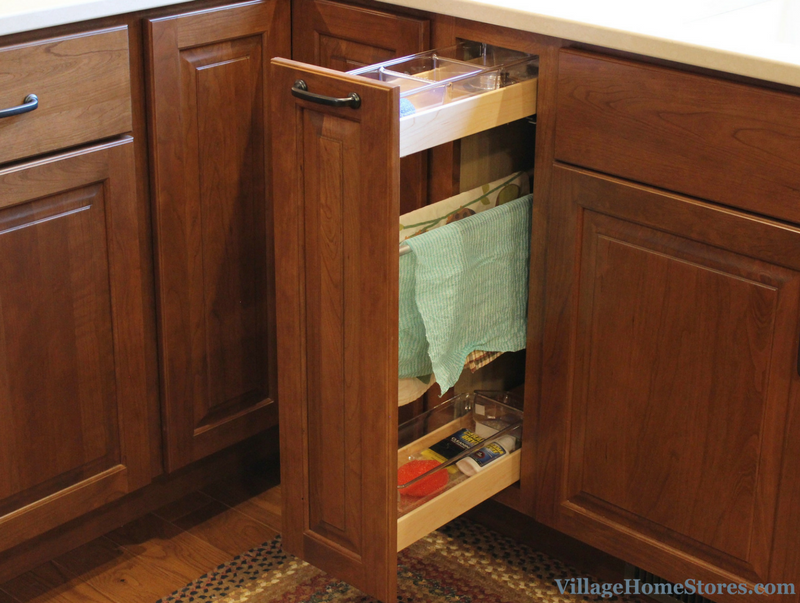 Keep cleaning supplies accessible but separate from food with one of these unique specialty cabinets. 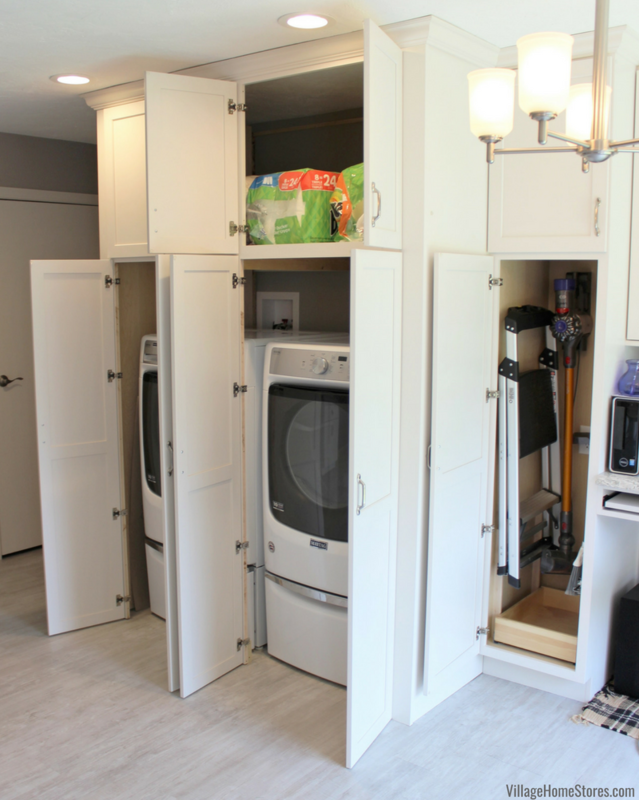 This towel cabinet also works great in a bathroom or laundry room design. 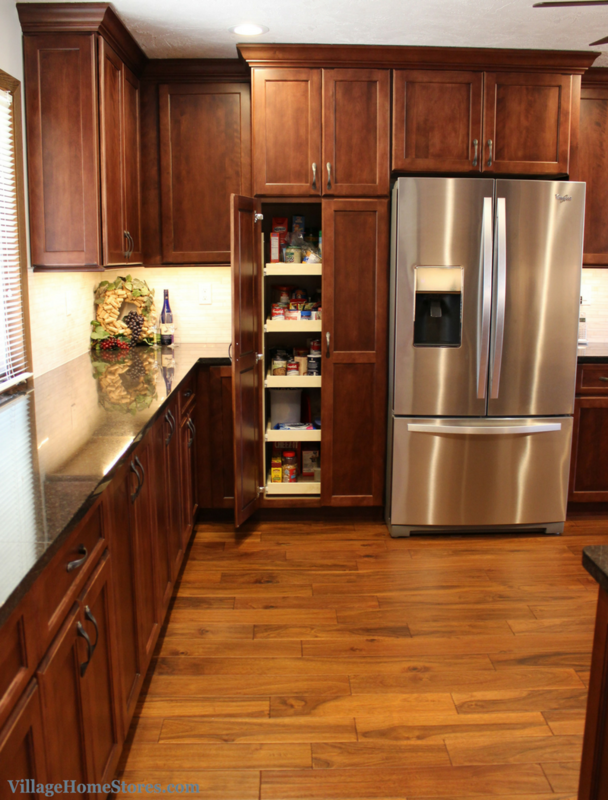 Surrounding the refrigerator is a tall pantry cabinet that has been fit with adjustable slide-out shelving. 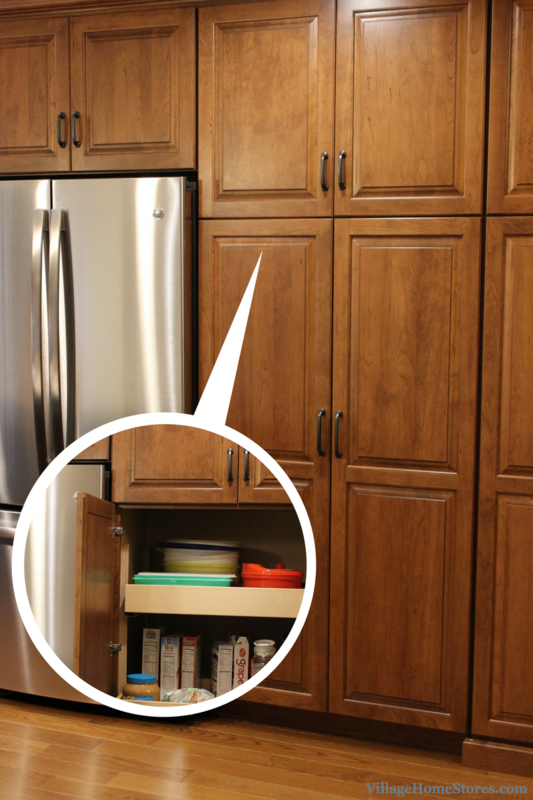 There is a built-in pantry storage area on the end of the kitchen that is not shown in these images. That pantry can now be used for household items and food storage can be exclusively in this tall unit adjacent to the refrigerator. 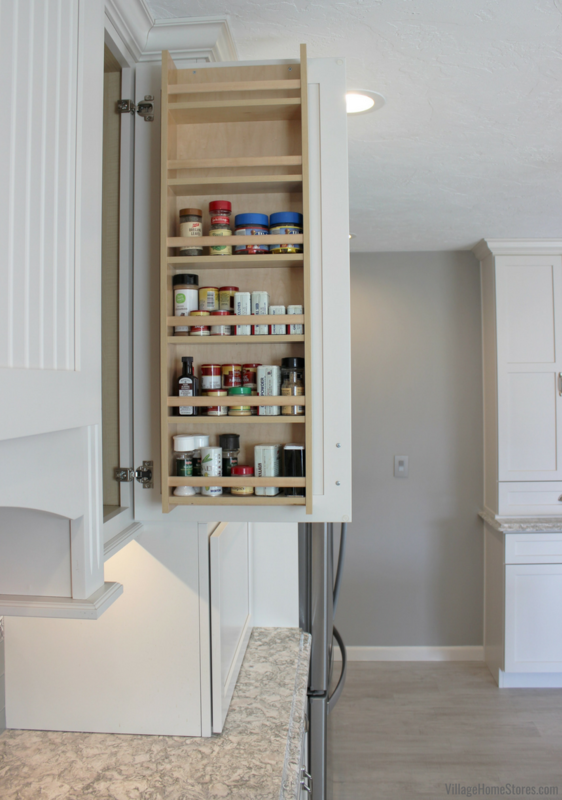 The tall pantry is capped off with an open shelf cabinet that faces those entering from the garage-entry end of the kitchen. 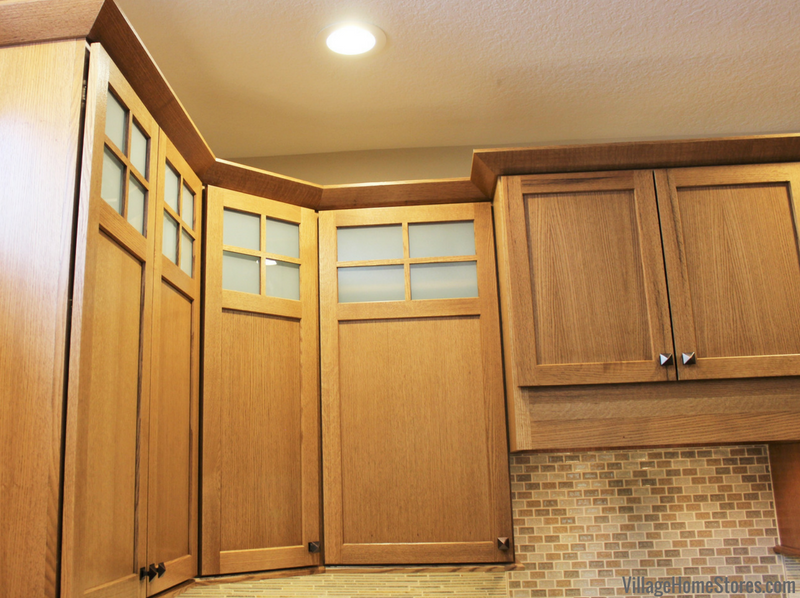 Applied doors have been attached to the end of this cabinet to sit flush with the pantry doors and customize the look. The shelves can be used to display seasonal decor, cookbooks, or decorative dishes. 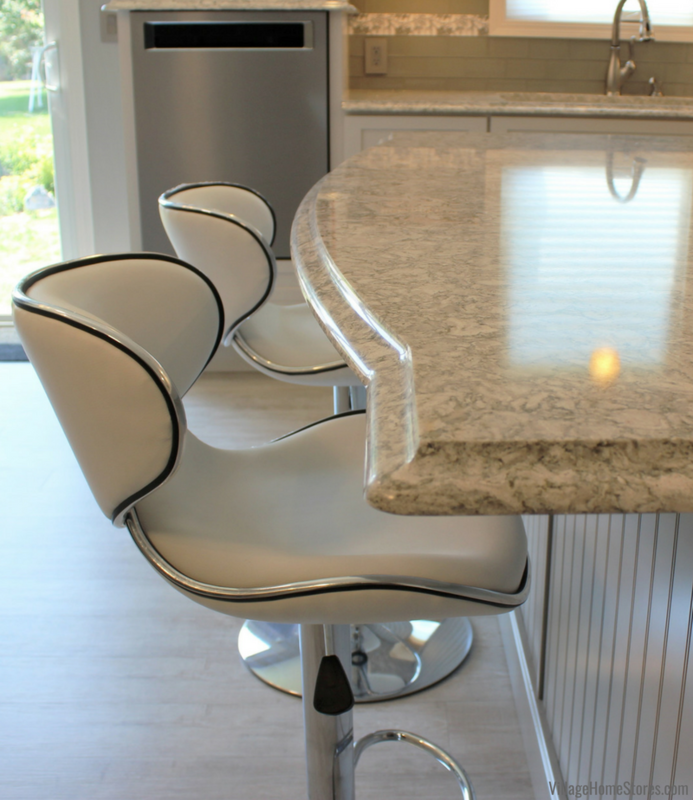 This design also works well on the end of an island as we have shown in this Moline kitchen tour. 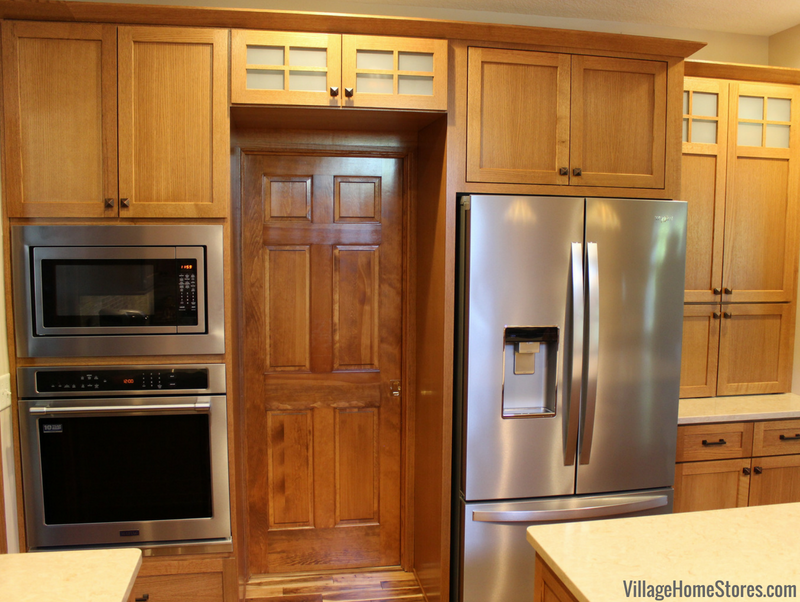 Has this remodel story got you excited about the possibilities in your own home? Are you ready to start your own before and after story with us? Browse the full album of photos from this project over on our award-winning Houzz page by clicking this link. 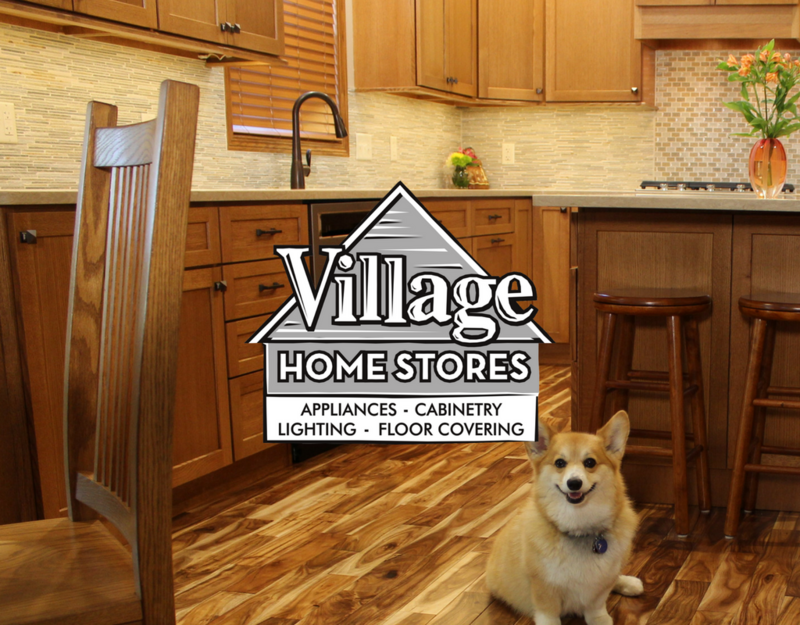 If you are ready to start the conversation about your project with Village Home Stores contact us today! Reach us at (309) 944-1344 or complete this short online form and a member of our team will get in touch with you to get started. We can’t wait to hear what you are working on.